I didn’t get to work on Junebug at all yesterday because I had a brunch scheduled with two of my girlfriends and then we did some shopping. By the time I got home, it was evening, and I decided that it was too late to start on anything. This morning, I spent too much time messing around with the photos on my computer and then taking Baxter to the park, so I didn’t get started until around 2pm. Oh well, sometimes I just have to do something else for a little while to regain the energy to get back to my project. 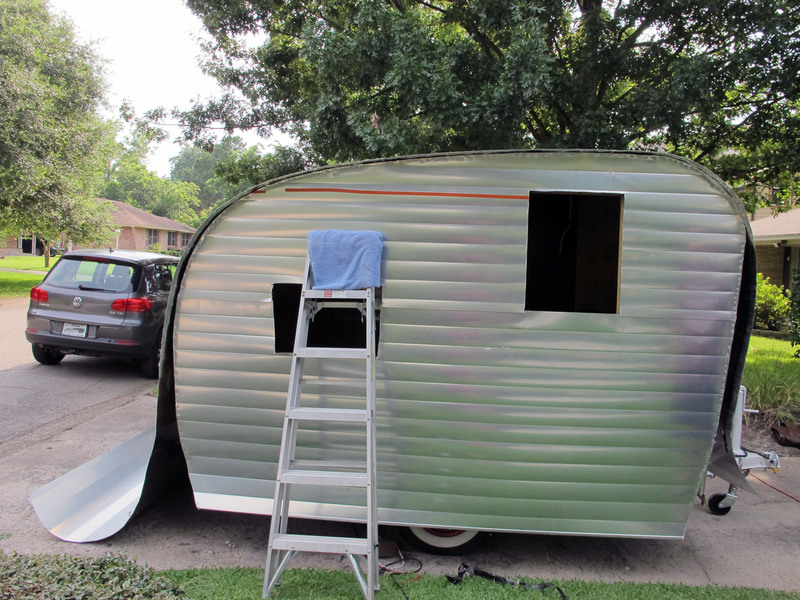 I’m getting closer to finishing the exterior of Junebug, so that’s exciting! The first thing I did today was roll Junebug out of the driveway and hook her up to my car to make sure my tail lights were still working. I connected them to the wires last weekend but didn’t try them out. I was having trouble getting the batt connectors to close over the wires tight enough, so I was nervous that maybe they wouldn’t work today. Thank goodness they did! After finishing that task, I rolled Junebug back into the driveway and set about finishing the street side. I trimmed the street side bottom edge and folded it under. I think the bottom edge looks ok folded under, so I may wait until later to add the trim. Next, I finished the rear panel. Rear is folded under and secured! Can’t wait to get the bumper on so the look will be complete. Still has the stupid creases in the metal on this side. I tried to get it to smooth out but it wasn’t happening. I’m hoping the bumper will cover it up a little. Screwed this little trim piece down and peeled back a little more of the protective film. This piece isn’t perfect since I made it, but it works! I will make a few more to go around the whole door frame. Next, I drilled little holes in the four corners of the remaining windows so I had a guide for cutting the hole. Then I used my sharpie to trace the outline. All cut out and ready for a window! Then I got to work cleaning the windows. They had paint and who knows what else from years of exposure to the elements. I also had to remove the bits of putty tape from the inside edges. 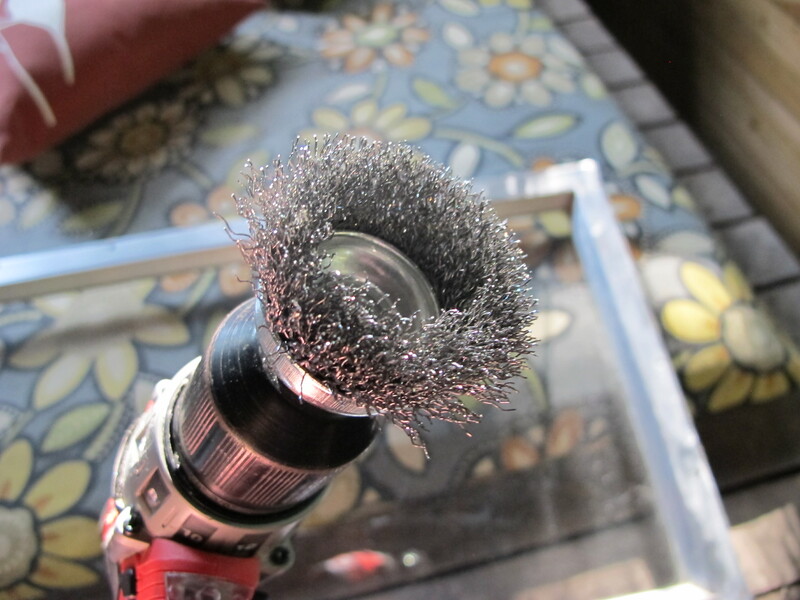 I used this wire wheel attachment for my drill that I picked up at Harbor Freight. It worked really well but it also scratched up the aluminum pretty bad. I don’t really think it will matter in the end though. My neighbor gave me this tube of metal polish. It works great! 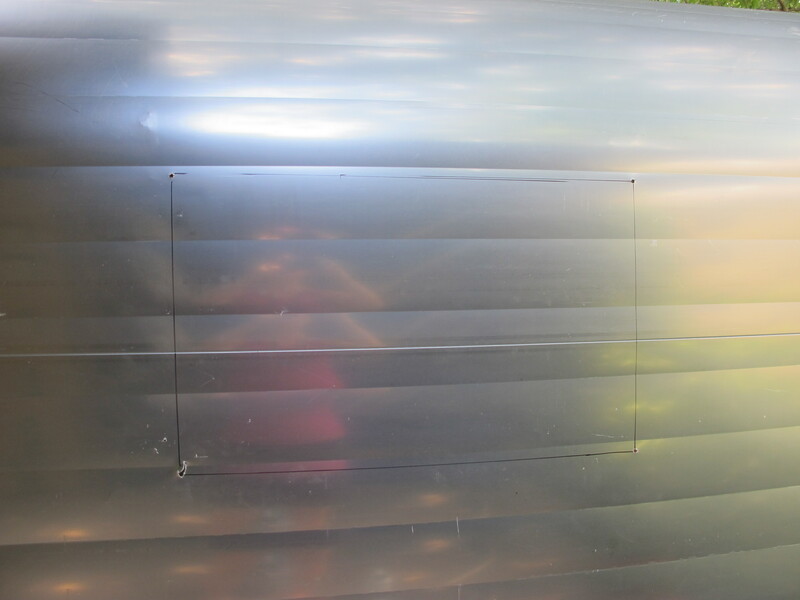 I thought my window was so shiny until I put it up against the pre-polished aluminum skin. I don’t see how I would ever get it that shiny so I will just live with it. It doesn’t look bad though. I had to peel back some more of the protective film to get it out of the cracks between the skin and the window. It looks so beautiful!! So my work is done for today. I need to finish cleaning and polishing the other three windows and then they’ll be ready to install. 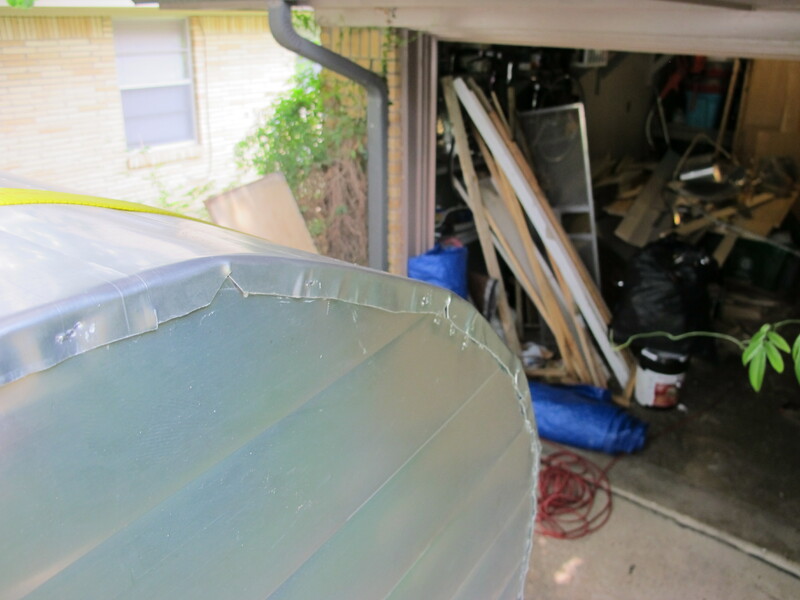 I am also planning to take some of the leftover skin to a sheet metal shop to get them to fabricate some frame pieces for the door. They are folded too tightly for me to do it myself without it looking bad. Hopefully I will be able to easily find a place to do it for me. Next week, I’m going to visit my family at my grandma’s house near Austin. I won’t be able to work on Junebug for a little while, but that’s ok. I’m very excited to see my family since I usually only get to see them a couple of times a year. I will post an update as soon as I am back at it the following week. Posted in 1961 Shasta Restoration Project and tagged 1961, canned ham trailers, DIY, exterior vintage camper photos, glampers, glamping, Hemet Valley RV, Houston, Junebug, projects, renovation, renovation projects, restoration, Shasta camper, Shasta Compact, Sisters on the fly, Tin Can Tourist, tiny houses, travel trailers, Vintage Camper Rally, vintage camper restoration, vintage campers, vintage Shasta. Bookmark the permalink. Warning: The first part of this post is a bit depressing. If you’re not in the mood to handle a depressing post, you can skip the first paragraph and come back to it later when you’re mentally prepared. I feel like I took a beating this week. Monday started out ok, nothing special happened. Tuesday, however, was the day from hell. First, I spent part of the night feeling sick and had to go into work a little late. Maybe my body knew somehow that the day was cursed and was trying to avoid it. On my way into work, I spilled coffee all over my white shirt. Then, when I got to work, I accidentally stuck my smart card (my badge that I have to insert into the computer to log on) into the cd drive because someone had the clever idea to put the card reader directly above the cd drive just to mess with people like me who are having a bad day and not paying attention. ugh Of course, I couldn’t get it out and I couldn’t go anywhere without my badge, so I had to recruit a coworker to go with me to the IT floor to get someone to help me. The guy took my computer apart, but I finally had my badge again after about an hour of wasted time! After that, I thought things could only get better. Unfortunately, I was wrong. It was a nice day outside, so I decided to forego my usual spin class and head home to take Baxter for a run in the park by my house. While we were out on our run, I saw a guy on a motorcycle hit a gravel patch, then the curb, then lose control and crash. I wasn’t very far away, so I ran over immediately, thinking somehow I could help. I don’t know what I was thinking since I didn’t have my cell phone, not to mention that I had a dog with me. I guess it was just instinctual. I was the first person to arrive on the scene, and as soon as I saw him, I wished I hadn’t. He wasn’t wearing a helmet, and his head injuries were pretty severe. I asked if he could hear me, and he didn’t respond even though his eyes were open. He also wasn’t moving. I noticed another car had stopped at this point, and the woman was calling 911. I was relieved. I thought the woman would get out of her car and come over, but she didn’t. The furthest she got was to open her car door and step right outside of it. She kept her distance and yelled over to me to answer the 911 operator’s questions. A guy then runs up to me and frantically asks, “What do I do? What do I do?” I was trying to hold it together. I guess everyone handles emergency situations differently. A few seconds later, a nurse pulled up in her car and, with a somber expression on her face, quickly walked over to the man, holding some type of first aid kit. I stared at the man for another minute as people started showing up from all around. I wondered if I needed to stay to talk to the police. I didn’t know if anyone else had actually seen the accident. Since it was only him and no other driver was involved, I thought maybe I didn’t need to stay. At this point, I thought I might start bawling uncontrollably, so I decided I’d better go. I knew he was getting help from the nurse until the ambulance arrived, and I was just in the way. When I got home I cried really hard. I don’t think I’ve cried that hard since my dad died. I think I spent the rest of the week trying not to think about this man but failing miserably. He was the first thing I thought of when I woke up and the last thing I thought of when I went to sleep. I tried to look up information online about him, because I thought I could have some sense of closure if I knew what happened to him. I’m pretty sure he didn’t survive, but I couldn’t find anything online about it. Unfortunately, these types of motorcycle accidents are WAY too common. If only he had been wearing his helmet, he would have been ok! This whole incident got me thinking a lot about what is really important to me in life. My family and my friendships are by far the most important things to me. And Baxter too of course. I want to tell my family and friends how much I love them every day, but that’s not always possible and would be a little over the top if I really did that I guess. I hope that they know how important they are to me without me having to say it every day. I kind of feel silly spending so much of my time alone, working on Junebug, when I don’t know how much longer I will have to spend with the people I care about. Life can be over so quickly and unceremoniously. I guess I keep working on Junebug because without a goal to work toward, I would feel lost. And I felt lost this week and needed something to take my mind off of it. So, now that I’ve gotten that off my chest, I will switch to the updates on my progress this weekend. Junebug has a few bruises as well thanks to my mistakes. It didn’t go perfectly (but when does it ever? 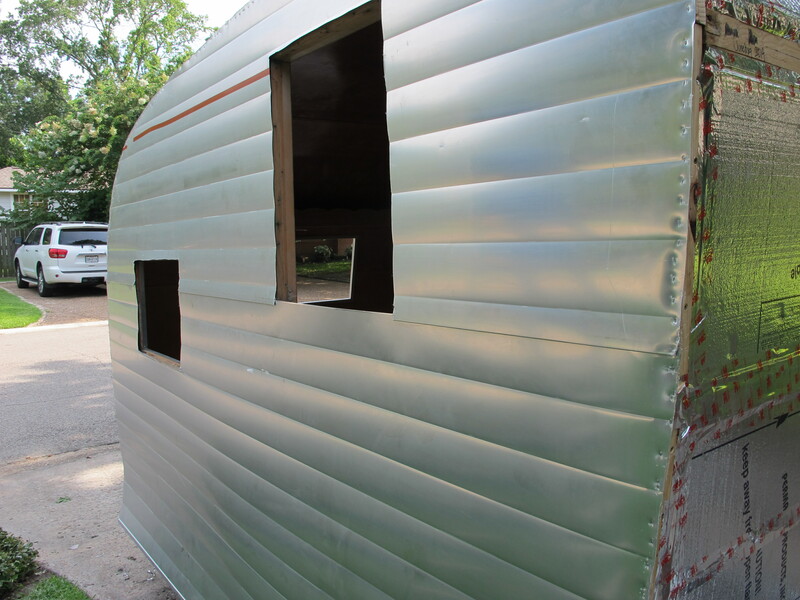 ), but I did finally finish getting the roof folded over and stapled down. it was definitely the toughest job I’ve had to do yet, even harder than putting the side skins on last weekend. Maybe because I was doing it alone, but I think it was just physically exhausting. 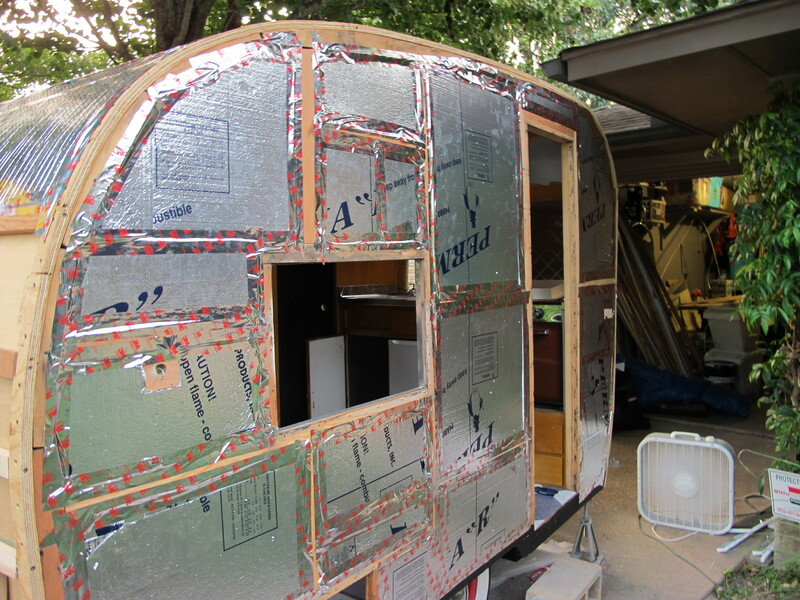 I started yesterday by finishing the insulation on the back panel. I realized immediately that Oscar, my welder, had forgotten to leave some wire for the license plate light. ugh! I had to call him because I wasn’t sure if I should wire it myself since that didn’t work too well the last time. haha Luckily, Oscar is a really nice guy and was able to come by my house around 6pm yesterday to fix the problem. He tested all of the wires and they worked, so let’s hope they stay that way once the lights are hooked up! 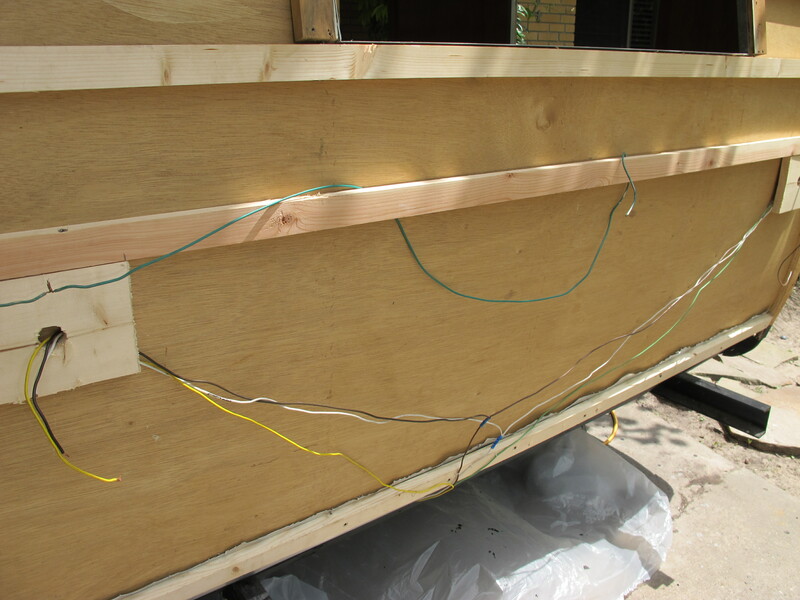 Wires are all ready to go and insulation is in! Next, I set out to patch up the mistake I made when cutting the side skin. 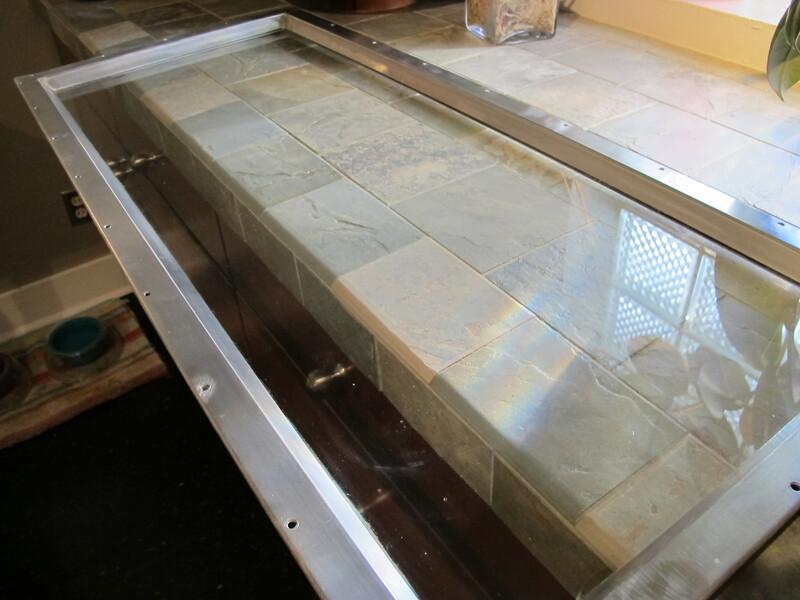 I cut a piece to fit over it and overlap slightly, then sealed the gap with gutter seal. It doesn’t look perfect, but I’m hoping maybe it won’t be that noticeable once the drip rail is on since it’s up high. On Saturday, I also finished trimming the bottom edge of the curb side and then folding it under. I put a few staples in, but not many because I will be screwing in some trim along the bottom and sealing it with gutter seal. I made this little piece to go in the doorway from leftover skin. I will be doing the same for the top and sides of the door frame. 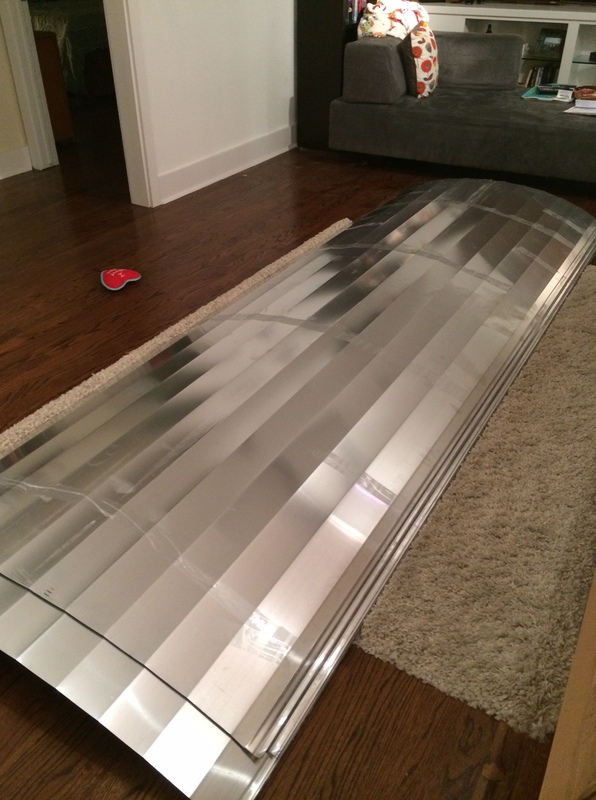 I would also like to use some of the skin for the door itself, but the way it’s bent, I will likely need to take the skin to a metal shop where they have the right tools. 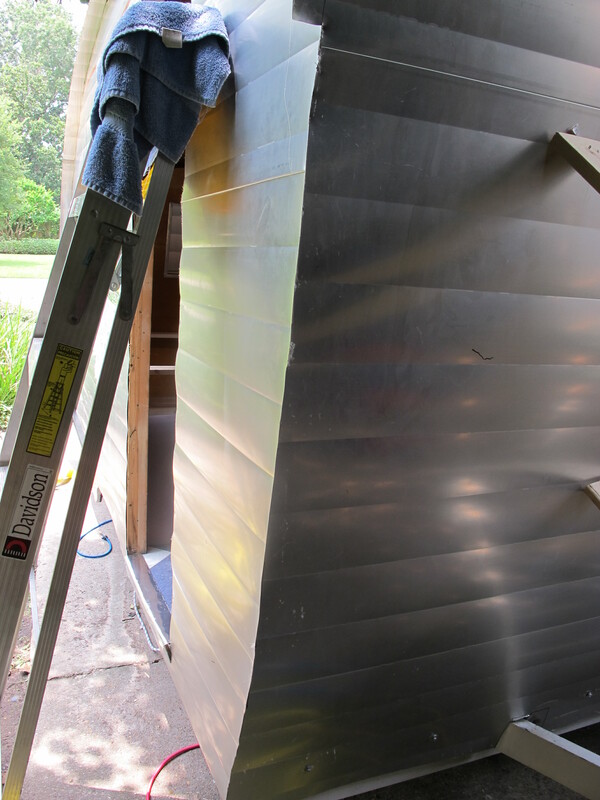 Today, I first removed a few of the stainless screws I had put into the curbing (the little strips of wood all along the outside of the frame that the roof staples into). I decided that now that the curbing was in place and the curves were achieved, I didn’t need quite as many screws. I was also worried about the screws being too close together and getting in the way of the screws that will hold the drip rail in place. After that, I started securing the skin. I started at the front, and worked my way toward the rear. 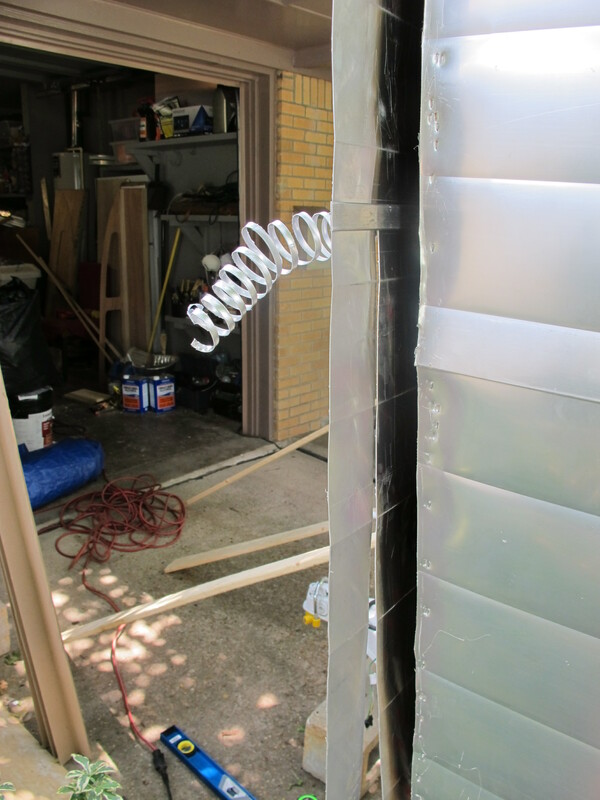 I did small sections on either side, going back and forth to hopefully avoid any buckling in the aluminum. I used a sharpie to draw a line after measuring so that I could cut the excess skin and only leave 1/2″ to fold over. Here’s what it looks like after cutting with my metal shears. I cuts a little slice right out of the middle. This allows the larger piece of metal you’re cutting off to stay put and not have to curl up. It’s pretty neat how it works! All ready to start folding over. I only cut sections at a time and then folded over. Here’s what it looks like after holding down a wood block close to the edge, then hammering over the edge with a rubber mallet. This was definitely a good arm workout! Front panel is getting close! As you can see here, I cut little triangular notches in the aluminum on the really curvy parts so that they would lay flat after folding over. It worked really well! Ugh! Buckling! I’m not sure what caused this, but I think it might have been the insulation on the opposite side that was sticking up a little too much. I eventually corrected the buckling, but unfortunately the whole roof moved slightly toward the street side as a result. Luckily I had enough skin left on the curb side to make up for it. It was slight enough of a change the it didn’t make the pattern in the skin look uneven (thank goodness!). Here’s a close up of the patch I did now that the roof is stapled down. It’s not really that noticeable I don’t think. Hopefully it will be even less noticeable with the drip rail over it. Front is all secure! Just need to cut out the window now of course. When I got to the rear of Junebug, I realized that I needed to go ahead and attach the tail lights so that I could make sure the excess wire was safely under the skin where I wouldn’t accidentally put a screw through it. I thought that would be an easy job, but it actually took forever! I couldn’t get the Batt connectors to hold the wire like Oscar could. I didn’t have a crimping tool, so I had to make do with my wire cutters. When I crimped the batt connector, I accidentally cut through it a couple of times. I finally got the wires to stay, but I’m a little nervous that the lights won’t work when I hook them up. I didn’t have the heart to try them tonight in case they didn’t work. I will try them next weekend when I’m not so exhausted. If something went wrong, I’ll have to undo the back panel and then restaple it after fixing the lights. It’s doable, but I REALLY don’t want to do that! I’m hoping that the bumper will help to hide these little blemishes. I am also rethinking my plan to put the spare tire on the tongue, and may put it back here after all. And here’s a shot of the whole thing after two hard days of labor. I still need to finish the very bottom of the rear, but it’s almost there! 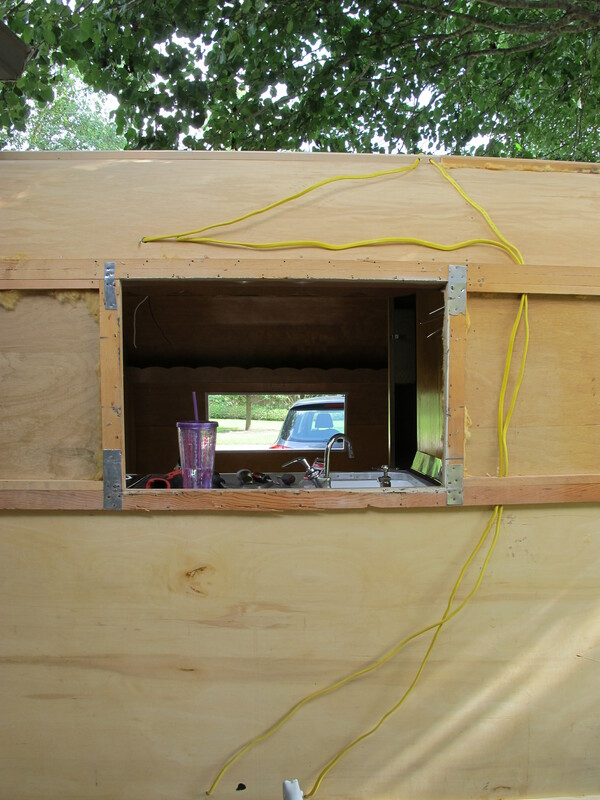 I also need to finish cutting out the window holes and add the drip rail and trim. I’m glad this week is over. I am hoping that next week will be better! Today is Sunday, and I am planning to rest (for the most part) and prepare myself mentally for my return to the daily grind tomorrow. This week off (minus Wednesday) has been very productive for my project but also physically and mentally exhausting. I have had a series of highs and lows, but overall I’m feeling pretty good about everything I got accomplished this week. 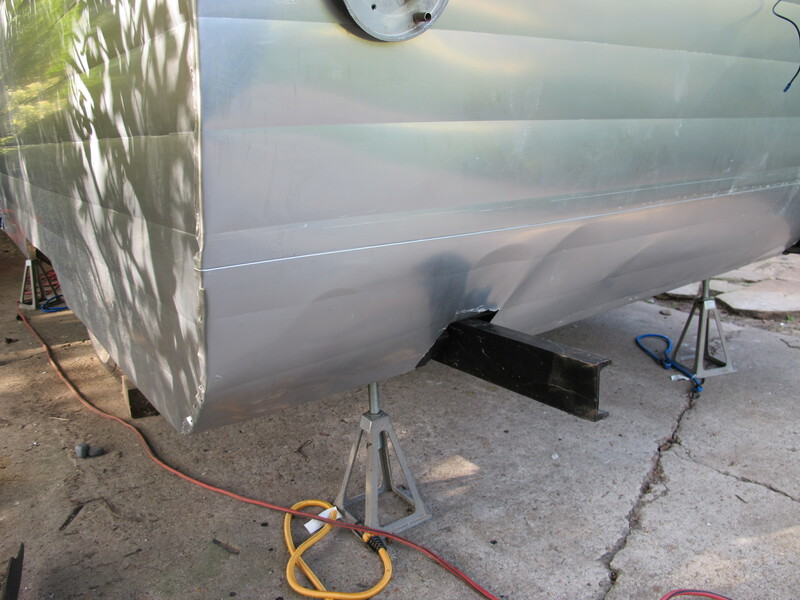 I’m not feeling good about two things though, 1. the electrical system in my camper and 2. the major screw up I caused on the upper edge of the street side siding due to getting carried away with my metal shears. Yesterday, I had two major meltdowns. 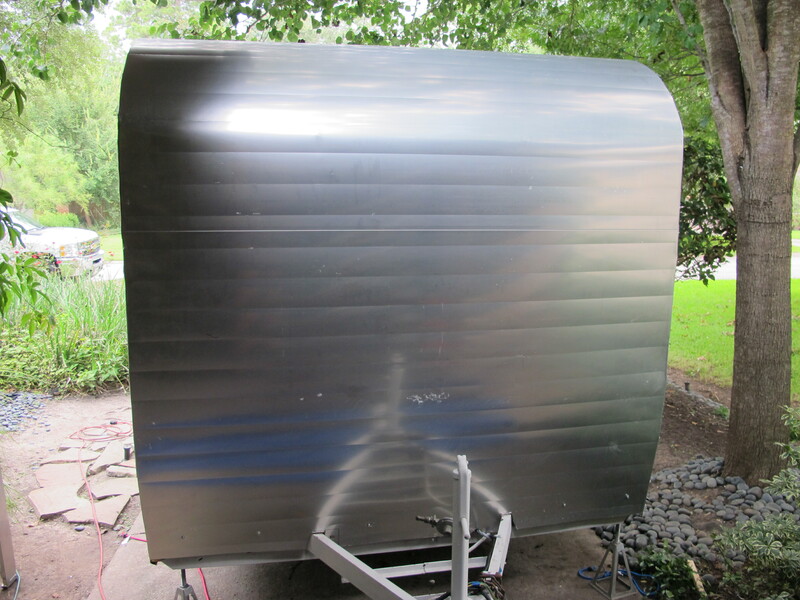 The first one was when I cut the side edge on the street side of the camper too short because I didn’t have any staples along the edge in that spot to guide me and I couldn’t see the edge on the other side of the excess aluminum I was trimming. I ended up going at an angle too sharp, and cut it about 2 inches too short along a section of about 5 or 6 inches. I panicked because once I did that, there was no going back. That piece had to be installed in the exact spot it was in, so I couldn’t move it a little upward to cover my mistake. I am still not fully recovered and don’t know exactly what I’m going to do to hide my horrible mistake and still keep the camper leak-proof. I had two of my friends over yesterday to help me, Jennifer and her boyfriend, Ayk. Ayk finally told me to just get over it because if this was the worst thing that ever happened to me, my life would be pretty good. haha I can understand that from his perspective it wasn’t a big deal, but I don’t think he understood just how devastating it was for me at that moment. I’ve been working so hard on this project and the new skin cost me $1600, not to mention all of the other things I paid a lot for, so to screw it up like that, well, let’s just say I could not “just get over it”. I’m sure I’ll figure something out, but it’s not going to be perfect like I had envisioned and that makes me angry since the mistake could have been easily avoided. This is what I’m talking about. 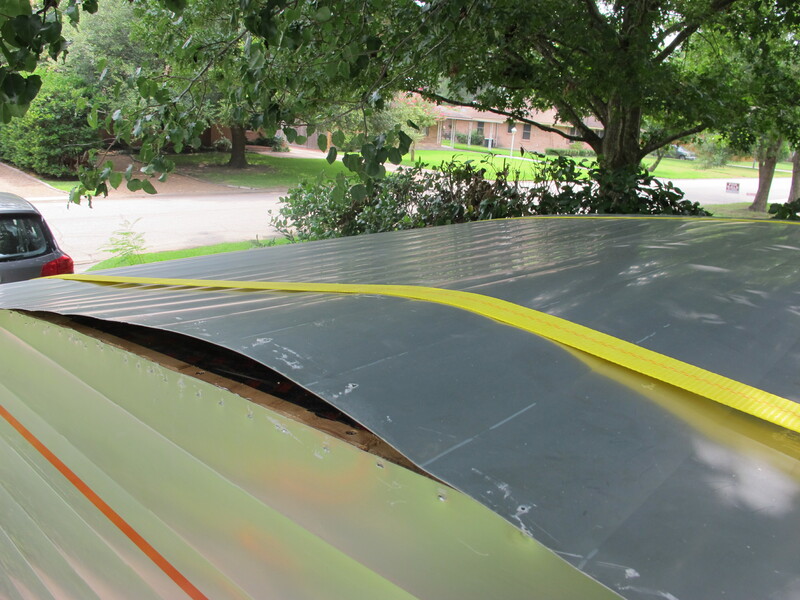 It doesn’t look as bad from here, but even if I fold the roof skin over further to cover it, it will still be difficult to cover up the seam because it’s too big of a gap for the drip rail to cover unless I move it down an inch and then it won’t be flush with the roof. I may end up doing that anyway, we’ll see. I’ll get to the second major meltdown shortly, but first I will go through the day’s events in chronological order. I was planning to get up really early yesterday to finish installing the insulation before my friends came over, but I was so tired and sore yesterday morning that I slept in until 8am. That still wasn’t too bad, but by the time I went by the tool rental place to pick up the crown stapler and then went to Lowe’s to buy a few more supplies, it was already 10am. 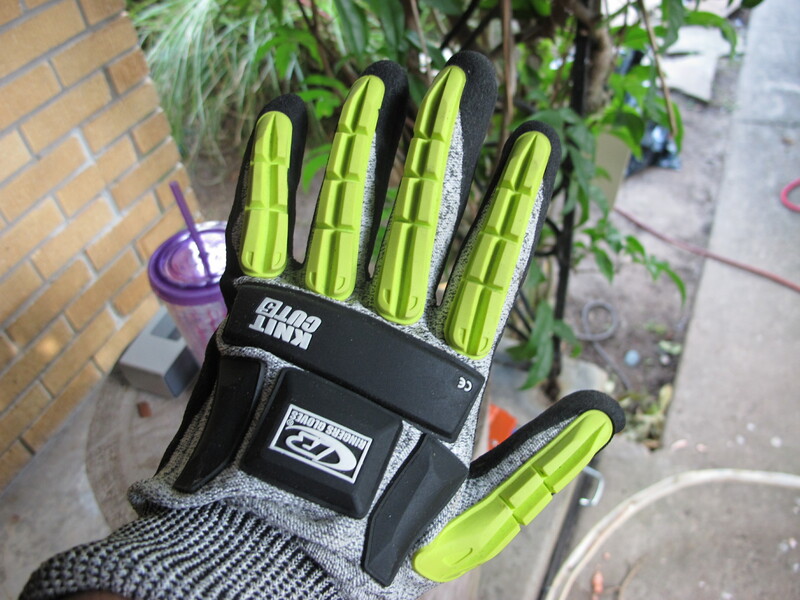 I got to work quickly after that finishing the insulation. It still took me forever to finish the street side. My friends showed up around 11:30am, and we moved the camper so that I could hook up the tail lights to my car to see if they all worked. If you recall, the welder had come over and replaced all of the wiring earlier in the week. 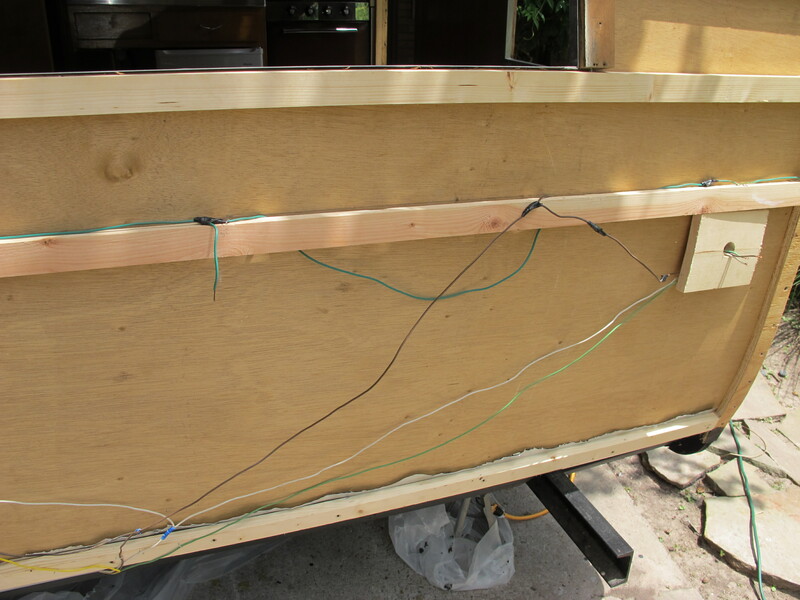 For some reason, he didn’t finish running new wires for the side running lights and the license plate light, but he told me I could use any of the leftover wire and hook it up myself to the hot wire, which was the brown one. I did that the other day and wanted to test it out. Well, sure enough, the blinkers and the brake lights worked when I hooked it up but not the running lights. I was so annoyed because this was the part I hooked up and it wasn’t that difficult so I don’t know how I screwed it up. 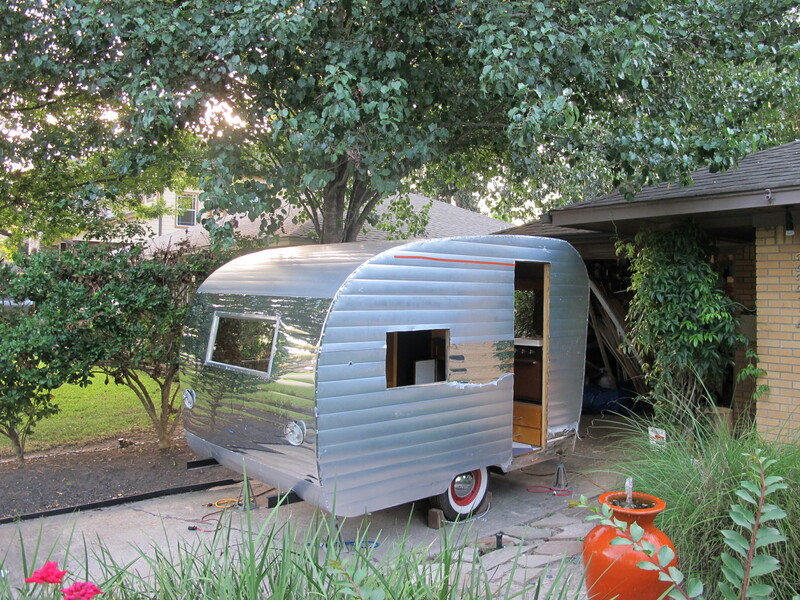 I called Oscar (the welder) and he said he would try to stop by later to check it out. 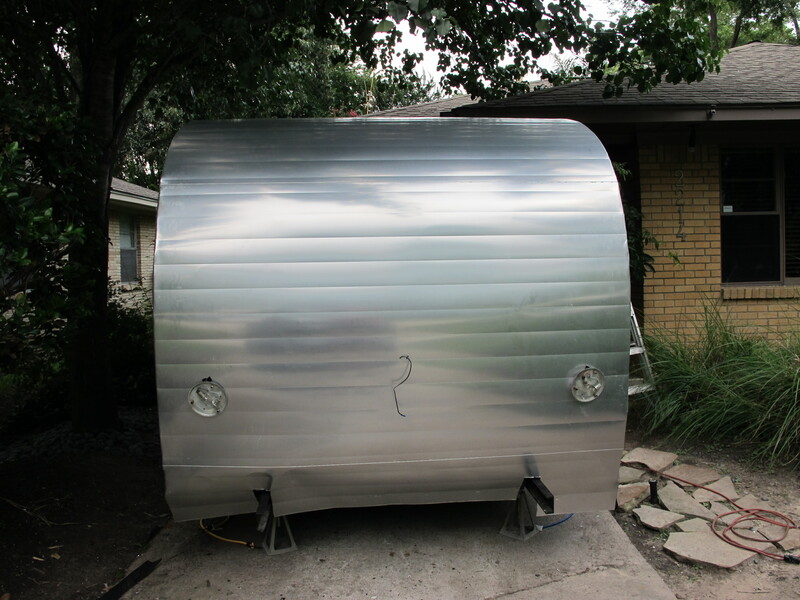 So… I forgot about that for the time being and we got started installing the side skin. 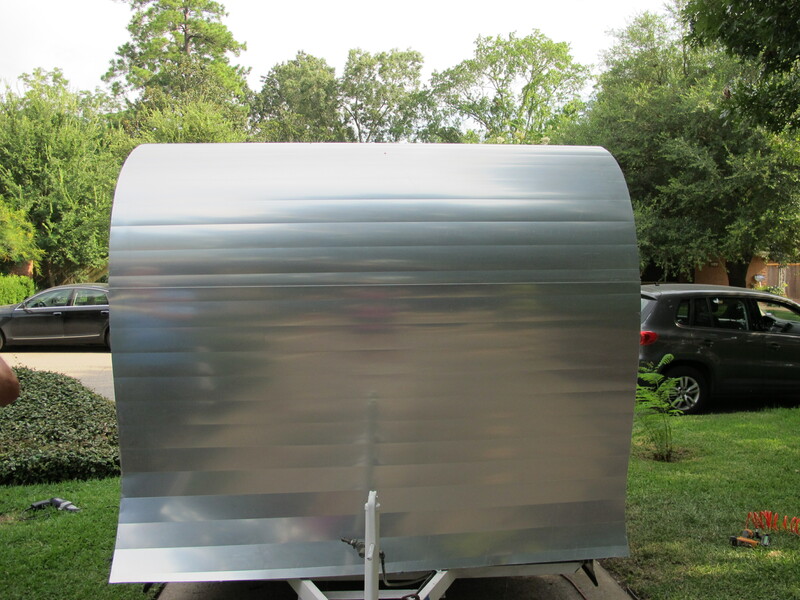 My original plan was the line up the factory roll (bent edge) along the bottom edge of the camper on each side and then trim the top of that piece so that it would fit inside the s-lock seam along the bottom of the top half piece. 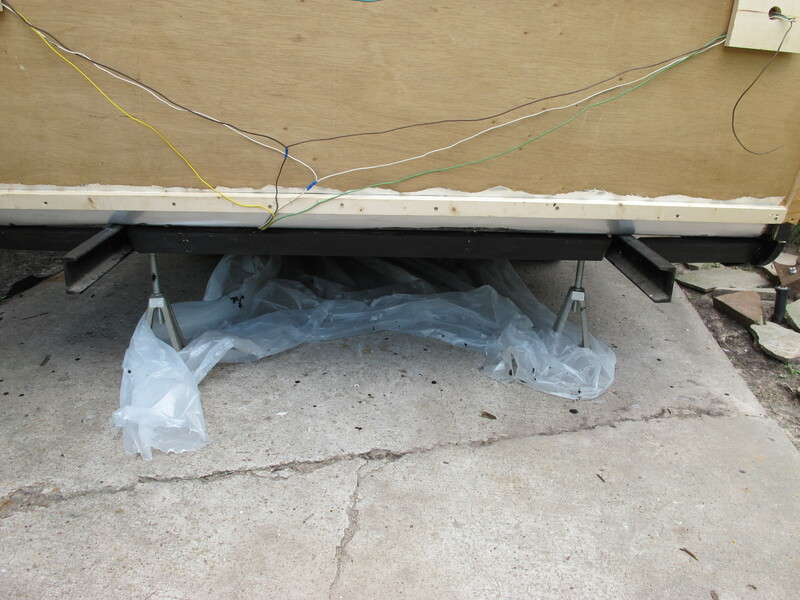 We realized after a bit of manoeuvring that it wasn’t going to fit. 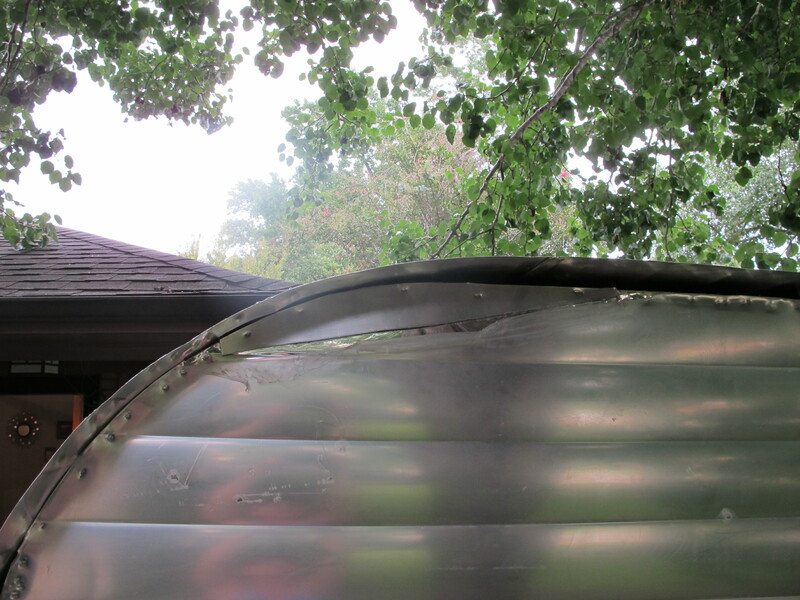 The bottom edge of my camper frame was uneven. The back piece of wood was slightly lower than the front piece on the other side of the wheel well. 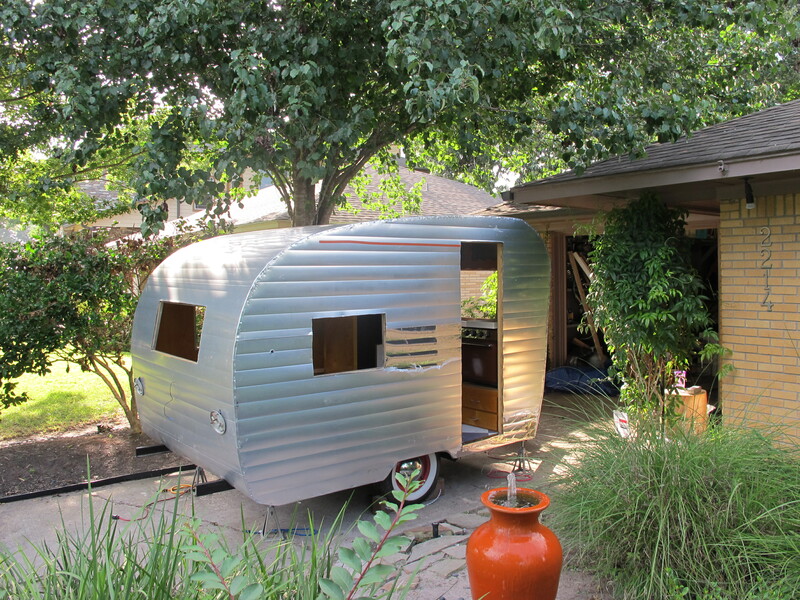 This could be my fault but it could also be the way it was made since these campers were far from perfect. So, I scrapped that plan and we installed the top piece first, then installed the bottom half and I will trim off the lovely factory edge later and add a trim piece. I’m still trying to figure out what type of trim piece to use. 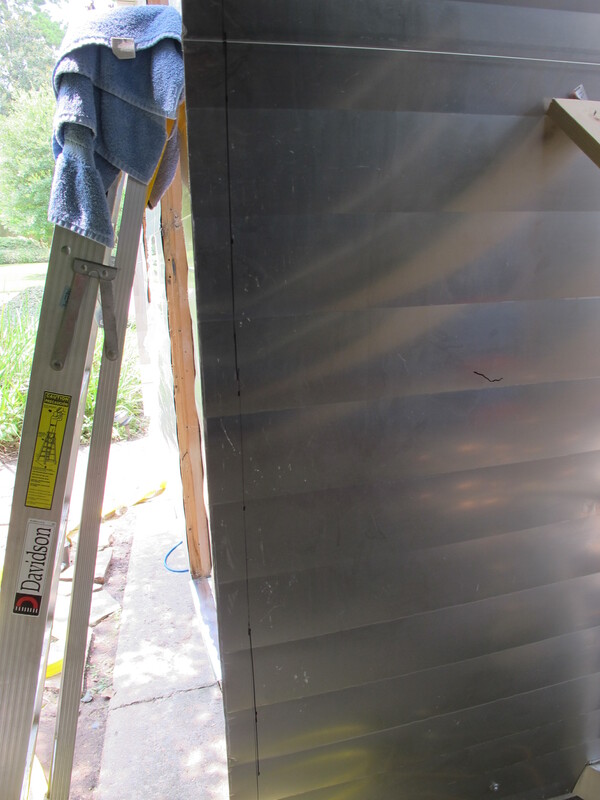 I could buy a piece of trim from a metal shop, or I was trying to figure out if maybe I could use the factory edge as a trim piece if I cut it just right since it’s already all nice and polished for me. All ready for the skin! Jennifer and Ayk were kind enough to hold still for a quick photo. We used some pieces of wood to hold the piece up after stapling the s-lock to the frame so I could more easily staple around the edges. All stapled and ready to trim the door and window! I probably used more staples than I should have because the stupid stapler kept misfiring. The crown stapler I rented was a pneumatic tool, and I had to play around quite a bit with the air pressure to get it to fire more gently. Initially the staples were going right through the aluminum! I ended up having to set the psi on my air compressor at around 30-40 which caused it to misfire a lot, but I finally got it to work without the staples going through the skin every time. I’m glad the skin was new at least because I would have had less room for error with the old skin. I’m dreading using it again for the roof, especially since I already messed up the side skins with lots of misfires. Hopefully it will work a little better now that I’ve had some practice….we’ll see. Door and window (upper halves) are cut out! They worked extremely well. I was able to cut clean lines, and I was able to make the cut out for the door perfectly so that I can use it for the external skin on the door frame. I can’t imagine cutting all of the excess skin with the manual shears! I guess the one positive to that would be that I wouldn’t have made that mistake of overcutting on the street side. But it would have taken me at least 3 times as long to do the job! My neighbor came by a few times and when he saw me using the metal shears, he offered to buy them from me after I’m done with this project. I don’t think I’ll need them anymore so I’ll probably sell them to him, but I’ll be a little sad to see them go because they are probably the most fun tool I have used yet! Bottom half is installed and ready to finish trimming the door. 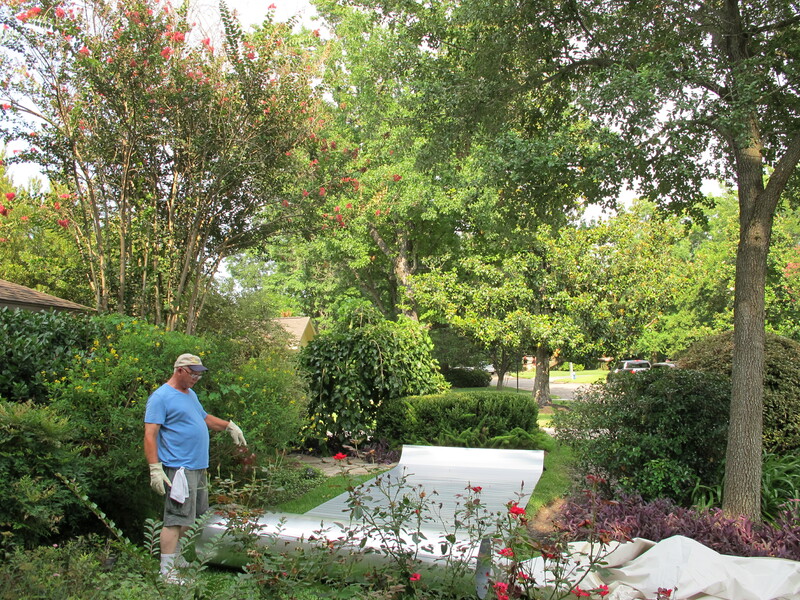 After finishing the sides, my other neighbor, Rick, decided to come over to see if we needed any more help. He’s always willing to lend a hand which is really nice for me! This is Rick in the picture below, standing next to my one long front/roof/rear piece. 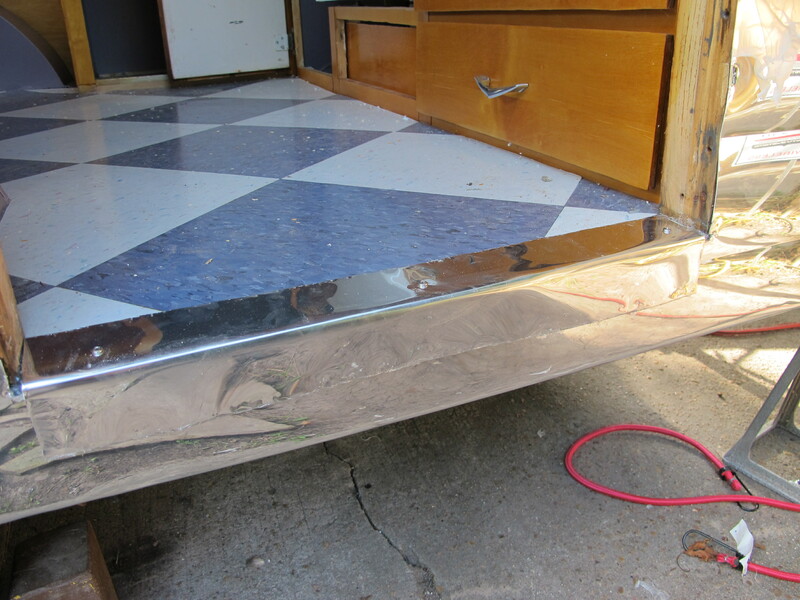 Rick and Ayk rolled it up and lifted it onto the roof of the camper, then unrolled it and we got it even on both sides. I think it’s kind of cute with the extra skin curling up at the back. It’s like Junebug curled her hair! haha I wish I could leave it but it just wouldn’t be practical. Here’s Oscar and his son, along with my neighbor Rick, trying to figure out how to fish some new wire behind the skin to go to the side running light. 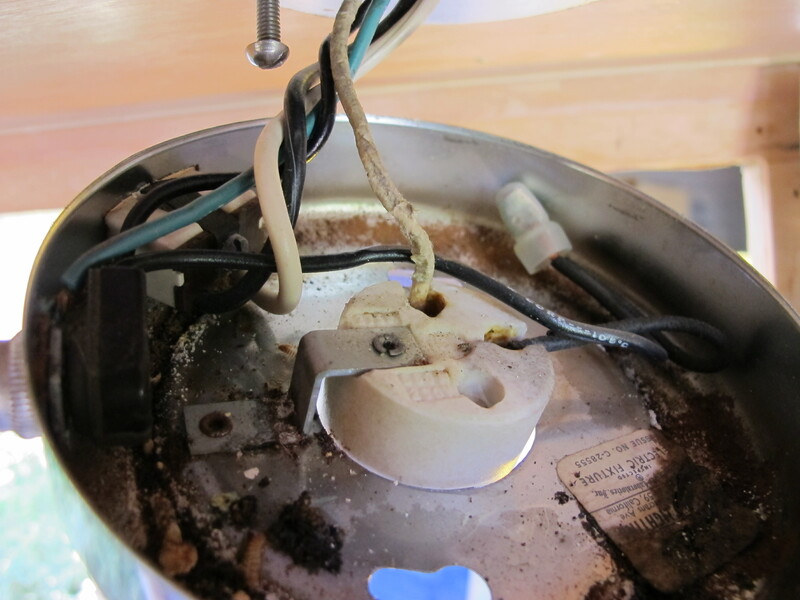 Here’s a picture of the melted wire. There used to be a black plastic protective sheath around the wire and here you can see it’s been completely melted away, along with part of the wires as well! The burning smell is still noticeable. 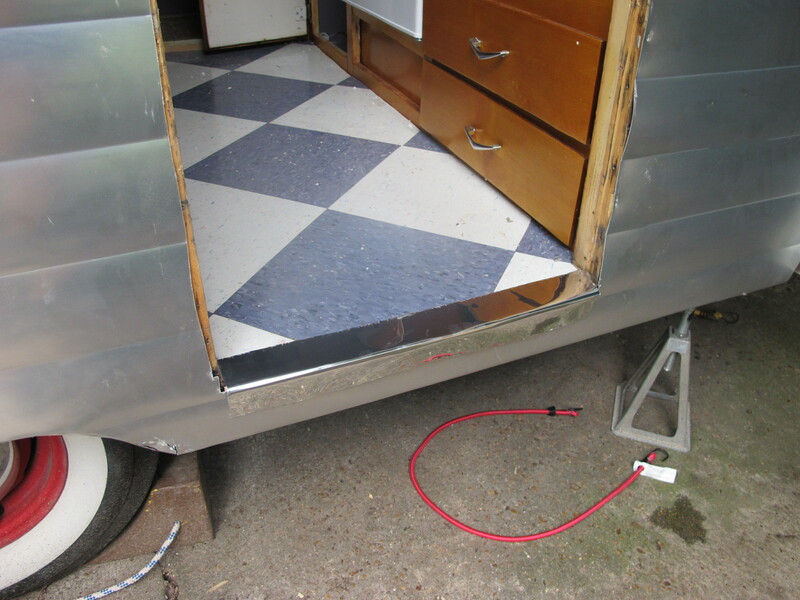 This whole wiring debacle has me second guessing whether I should be running all of the new electrical wires in the camper myself. I already installed the wires and was worried that somewhere in the holes I drilled, there could be a tip of a staple or twist nail sticking out. I closely inspected all of the holes in each beam before fishing the wires through, but I’m still uncomfortable. 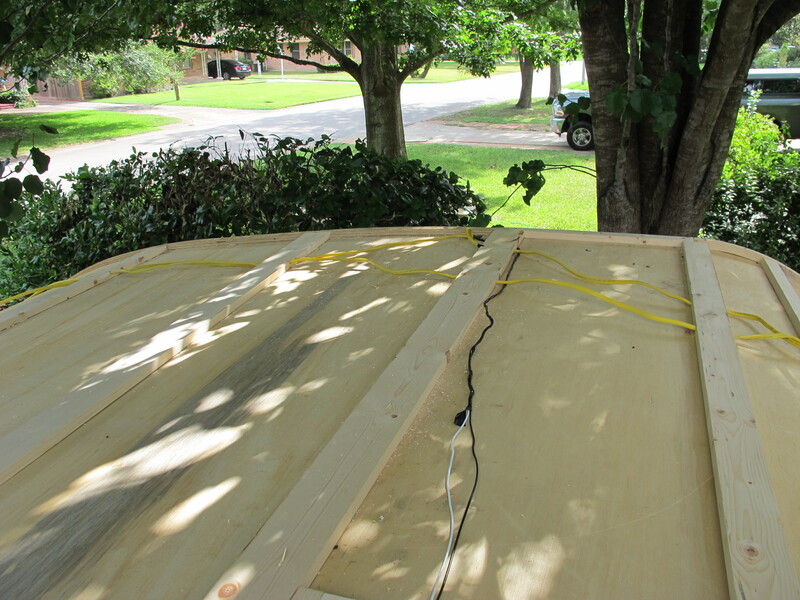 I may wait to secure the roof until I can put something else inside the holes to further protect the wires. There’s not much room for anything else, but I am thinking maybe I can slide something thin inside there, maybe a really thin plastic sheath or some sort of material that can protect the wires. I am not planning to put anymore staples/screws/nails into the ceiling, so that should protect the wires. I will also likely get a professional to come inspect my wiring set up before I plug it into a power source, just to be absolutely sure it’s correct. A 30 amp power system is capable of melting more than just a few wires! 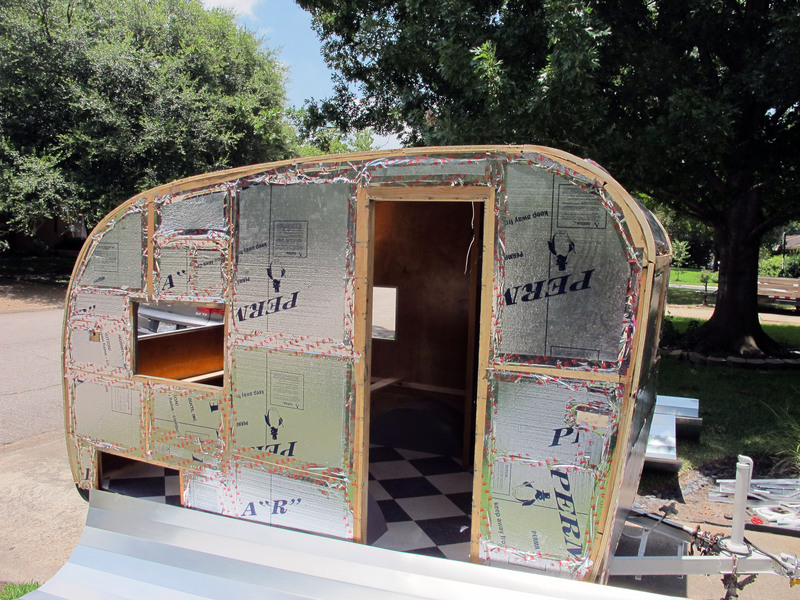 After Oscar left, I finished the cut out for the door and finished screwing in the screws at the base of the front of the camper so my roof would stay aligned. That was about all I had the energy left to do. Ayk had to leave, so Jennifer stayed and helped me clean up the huge mess we had made. 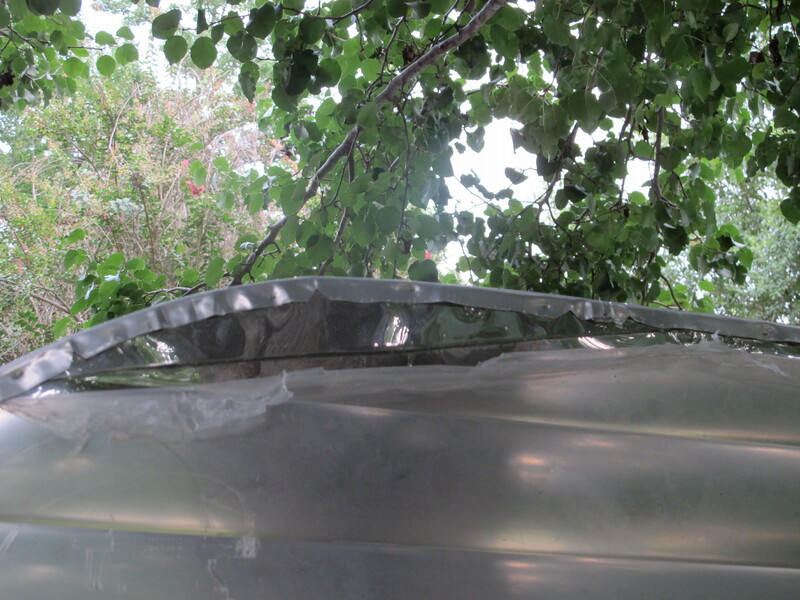 There were metal pieces everywhere! 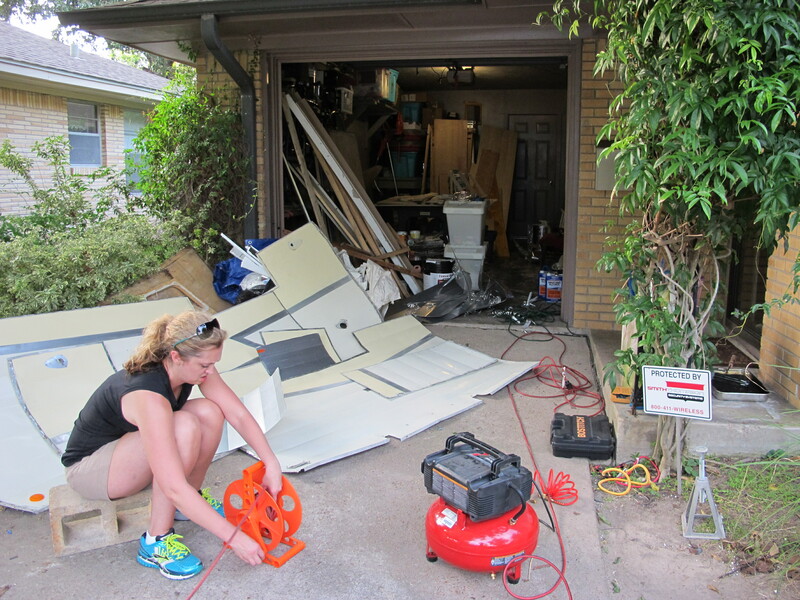 Here’s a picture of Jen helping clean up and all of the old skins laying outside since I had to dig a few of them out through the day to use as templates. So, overall my week has been fairly good, and yesterday was quite eventful as you can see. 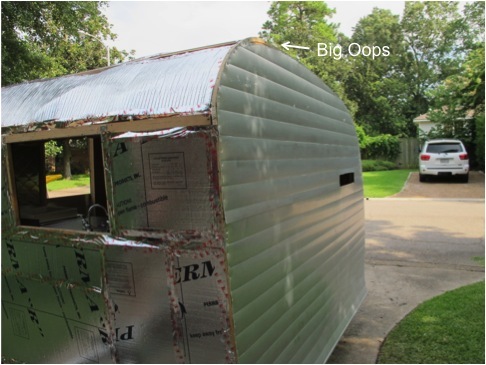 I am planning to watch Larry’s videos again at www.cannedhamtrailers.com on how to secure the roof so that hopefully I won’t screw anything else up. I’m also going to have to ask him for advice on how to cover up the spot where I messed up. I hope someone can help me come up with a creative solution! I’ll leave you with the same photo I posted last night since this is the current state of Junebug. There is still a protective film on the aluminum to protect it from scratches. I peeled it back a little so that you can see how shiny it’s going to be. I’m going to wait until it’s all installed though before I remove it completely since it helps to protect it from the elements. It’s going to look so good when I’m finished, but at the rate I’m going, it sometimes feels like I’m never going to get there! 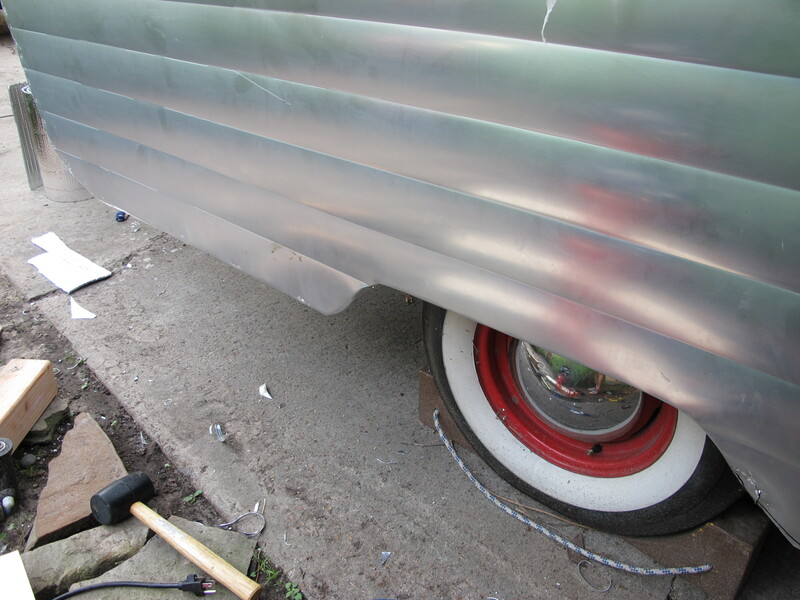 I’m about to go outside to trim the excess from the rear so that it’s not sticking out from under the tarp all week. I’m not sure if I have the energy to do anything more than that on Junebug today. I don’t think I’m going to reach my goal of finishing by the end of this month but oh well. I don’t want to rush anything again and make another big mistake. I hope everyone had a nice weekend, and I’ll see you next week! Posted in 1961 Shasta Restoration Project and tagged 1961, canned ham trailers, DIY, exterior vintage camper photos, glampers, glamping, Hemet Valley RV, Junebug, projects, renovation, renovation projects, restoration, Shasta camper, Shasta Compact, Sisters on the fly, Tin Can Tourist, travel trailers, Vintage Camper Rally, vintage camper restoration, vintage campers, vintage Shasta. Bookmark the permalink. I’m too tired to write a post tonight. It was a REALLY long day. I didn’t finish putting the skin on in one day. I think maybe I was a little delusional thinking I could finish in one day. I did get pretty close though! I just thought I’d write a quick note to say I’m still alive (although I did get a pretty good shock from the tail light wires today). I will write the full update tomorrow once I’ve had some rest. Posted in 1961 Shasta Restoration Project and tagged 1961, canned ham trailers, exterior vintage camper photos, glampers, glamping, Hemet Valley RV, Houston, Junebug, projects, renovation, renovation projects, restoration, Shasta camper, Shasta Compact, Sisters on the fly, Tin Can Tourist, tiny houses, travel trailers, Vintage Camper Rally, vintage camper restoration, vintage campers, vintage Shasta. Bookmark the permalink. Fortunately, today went pretty well and I got a lot accomplished. 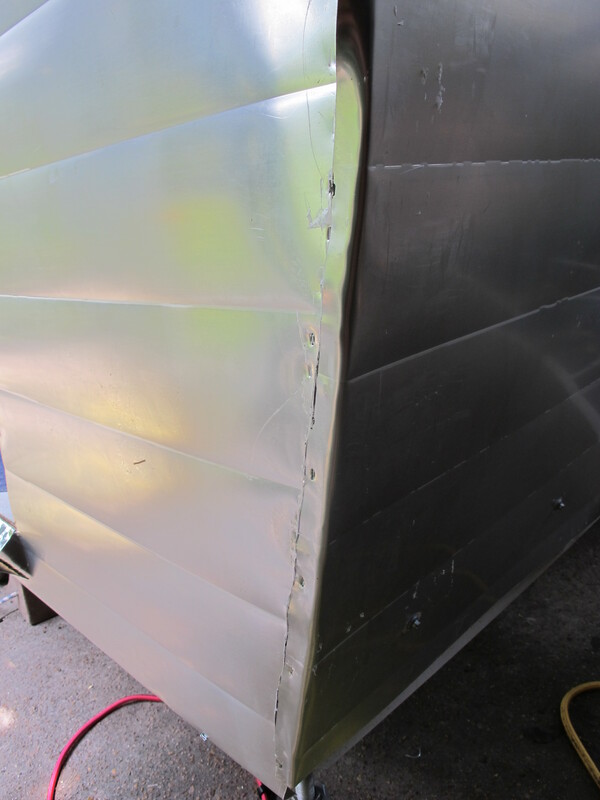 Done – Install one more piece of wood along the bottom rear of Junebug for skin to attach to, will need to modify slightly from original design due to the steel beams sticking out of the back for the bumper. 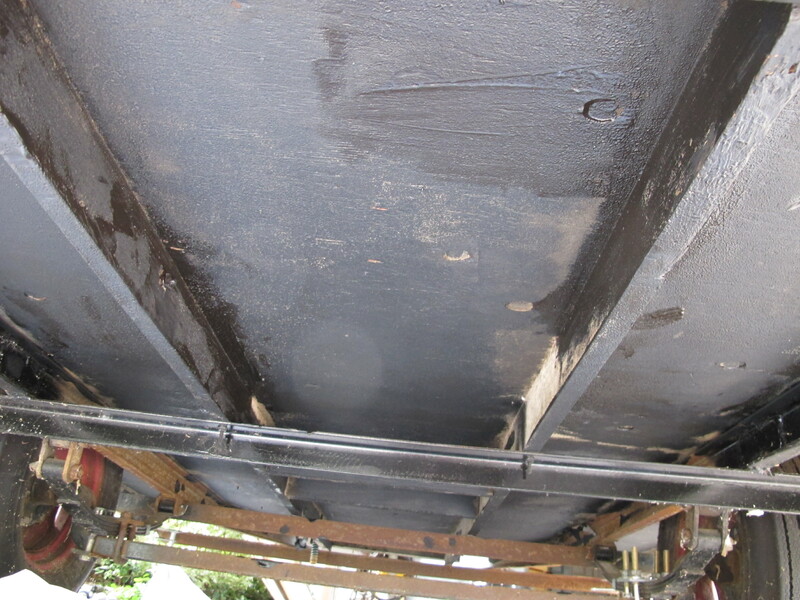 Done – Paint undercarriage with black fence post paint after spraying some sealant on the seam of the metal flashing along the rear undercarriage (just to be extra sure it’ll stay dry). 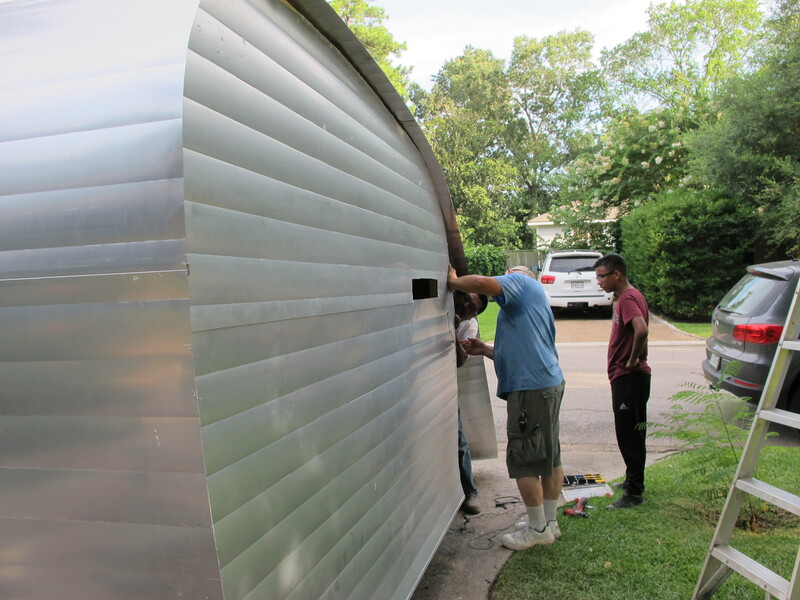 Almost Done – Finish building a new frame and support beam for the roof vent and install. 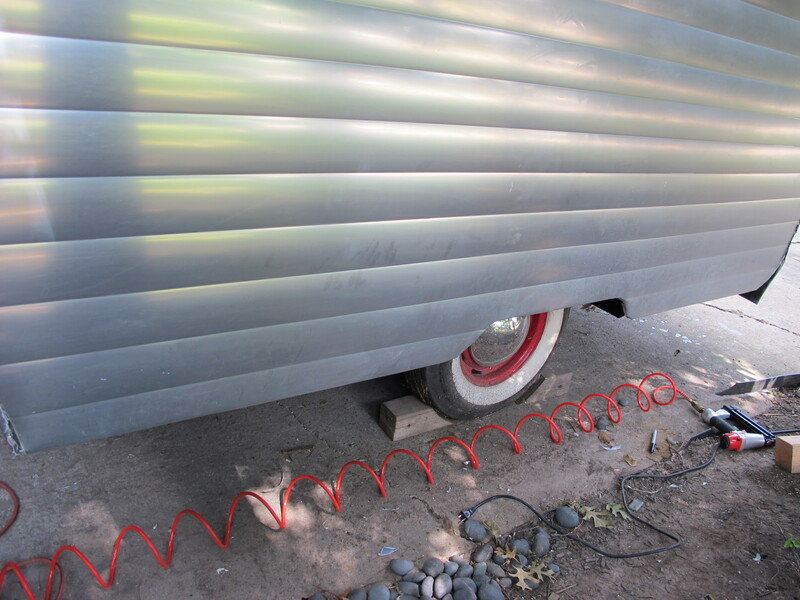 Tomorrow – Finish running the wiring for the running lights and license plate light and hook up to car to test. 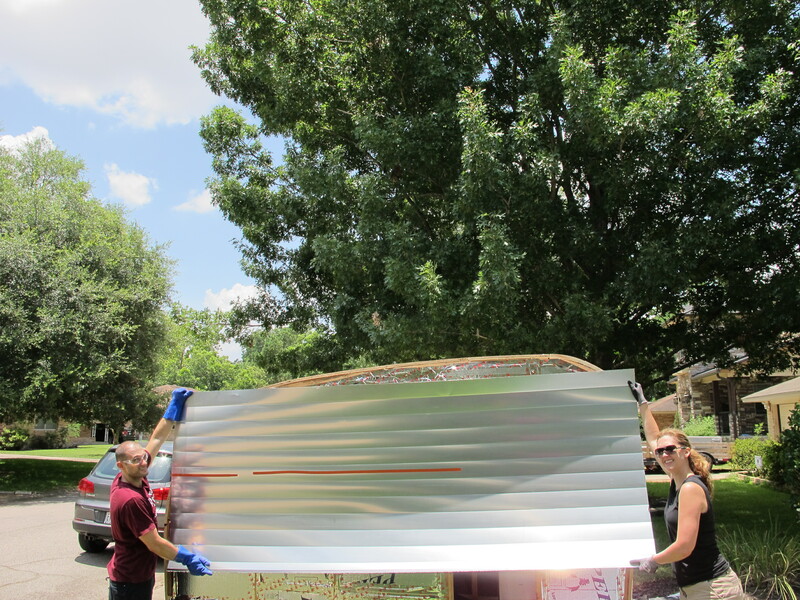 Tomorrow – Purchase rigid foam insulation and install. I started today by going to Lowes and Home Depot to buy electrical wiring and other supplies. 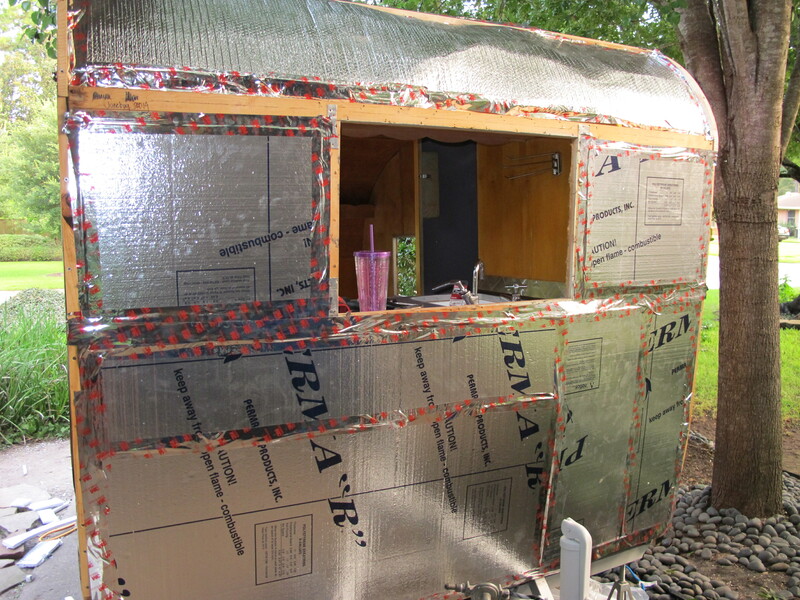 I went ahead and bought some Reflectix radiant barrier insulation while I was there to cover the really curvy parts of the ceiling. I’ll go back tomorrow to get the rigid foam insulation. I’m going to have to cut it because it won’t fit in my Tiguan otherwise. While I was at the store, the freight company called to say they’d be at my house at 12pm. Huh? They were supposed to show up between 3-6pm! I told the guy that I could only get a helper between 3-6pm, but he assured me that he would help me unload the two boxes. He showed up about 12:30pm, and he was true to his word, he helped me unload the boxes and even opened them so I could inspect everything. Everything looked good for the most part. There was one spot that was damaged. but I decided it was a tolerable dent and I certainly didn’t want to send it back so I went ahead and signed for it. I was able to drag the boxes into my kitchen for now since my garage is full. New siding! This is the back of it, so it doesn’t look as shiny on this side. Here’s the dent that is in the side pieces. Not sure if it is affecting the other pieces underneath or just this one. 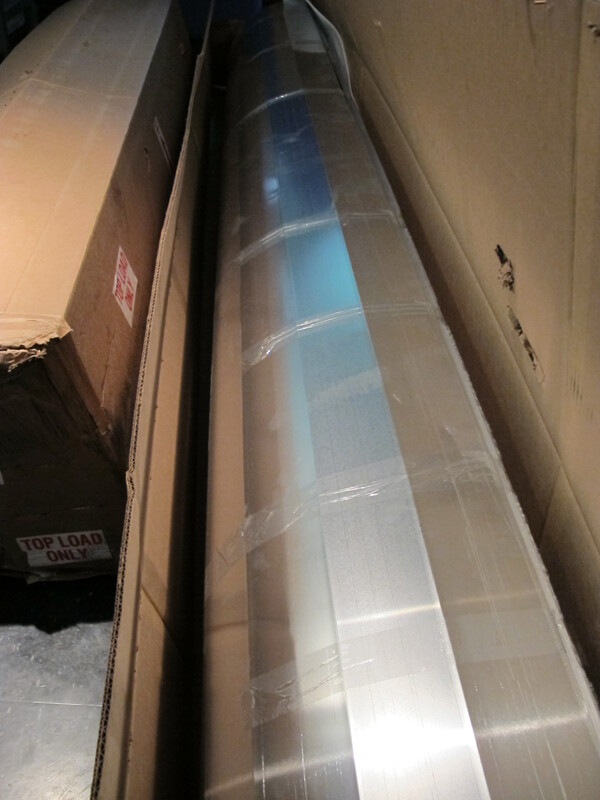 I’ll find out when I unroll them. It is right next to the part that goes up inside the s-lock seam and toward the end of the roll, so I’m hoping maybe I can hide it somehow. 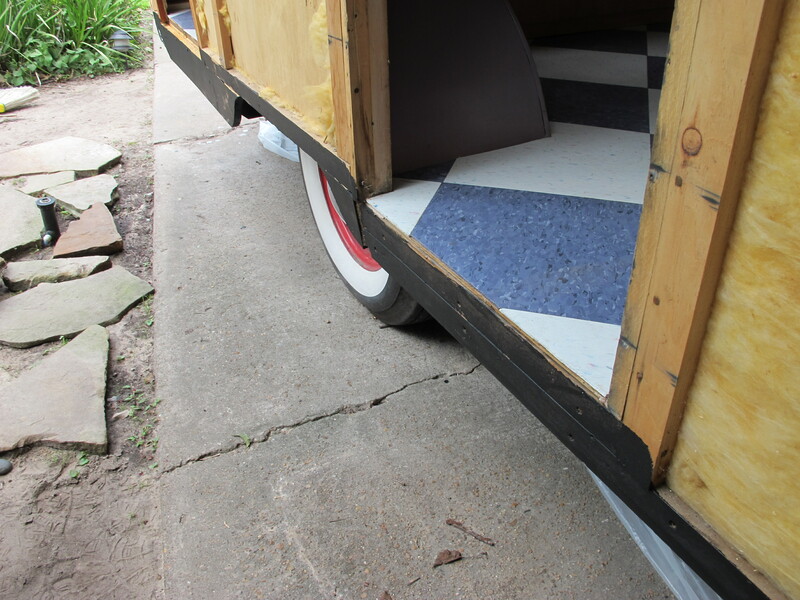 After my siding arrived, I resumed working on adding some additional pieces of wood to the rear so that I could attach the siding to it. I don’t think I did this perfectly thanks to the steel beams in the way, but it should work anyway. As you can see from the picture below, I will have to cut some slots into the siding to get it to curve around the steel beams. I have to do the same thing in the front, so hopefully it will still look good when I’m done and seal properly. Next, I got out the fence post paint. This stuff really does look and smell like asphalt, gross! 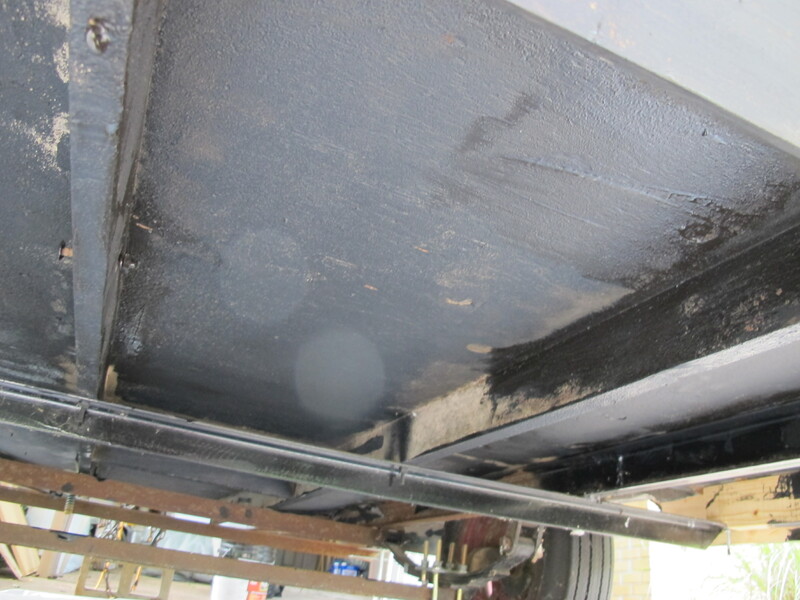 Here’s the undercarriage before. There are a LOT of spiders under here. It’s a wonder I didn’t get bitten…that I know of. Undercarriage after. As you can see, I missed a few spots. I was using a roller and it was hard to get all the corner areas. I will go back in later and finish it up. 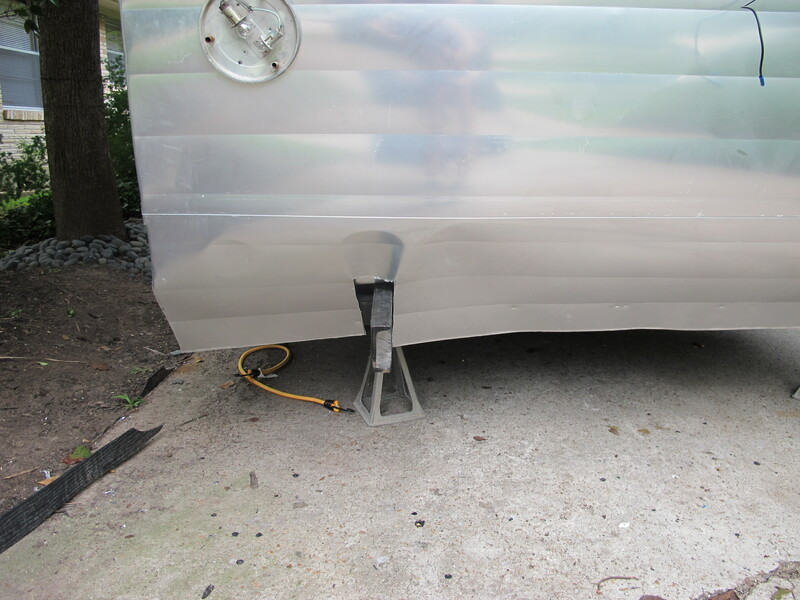 I also applied some fence post paint to the wood along the bottom all around the camper for added protection against water damage. After I finished this task, I was covered in fencepost paint spots. Later, I had to scrub off the top layer of skin to get it off! That stuff is messy. My last project of the day was the make a frame to go around the Fantastic Vent. I made a frame, but I didn’t realize that the vent sticks up quite a bit higher than the old vent, so I will need to add another layer of wood. I’m kind of worried that it sticks up too high and will make my skin look lopsided. 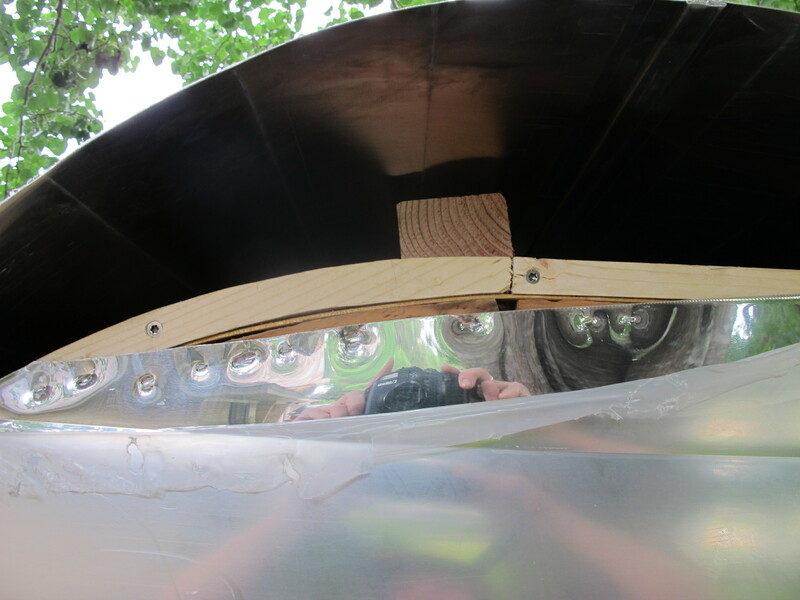 With the top part of the vent on, it sticks up a full 7/8″ higher than the cross beams. I’m sure this is to ensure the water runs off and doesn’t collect causing a leak, but that seems excessive. I guess I’ll see how it looks when the skin is on, hopefully it won’t be as bad as I think. Roof pic before putting the actual vent in. 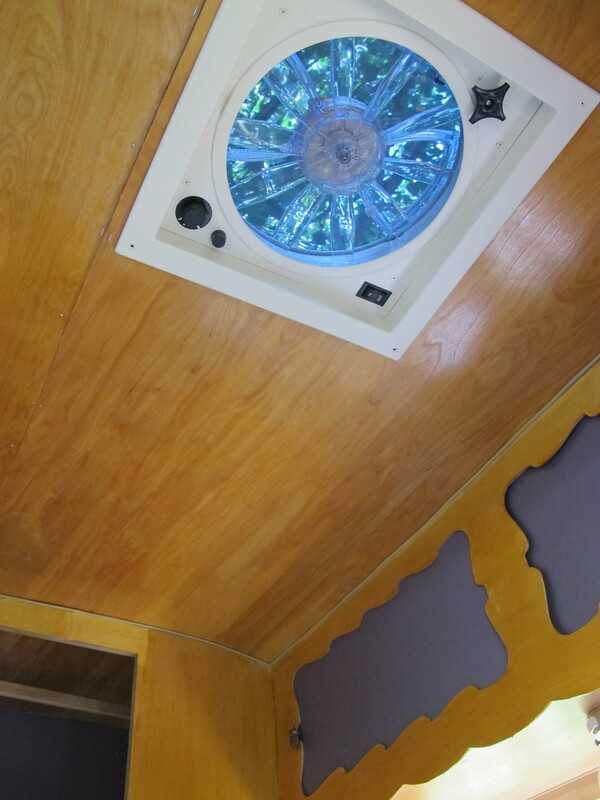 This is just the piece that goes inside the camper and connects with the vent on top. The view of the insert piece from the interior. I haven’t installed it yet, but this is what it will look like on the interior. I’m happy with how the Fantastic Vent looks inside. I am glad I got the translucent lid instead of opaque. 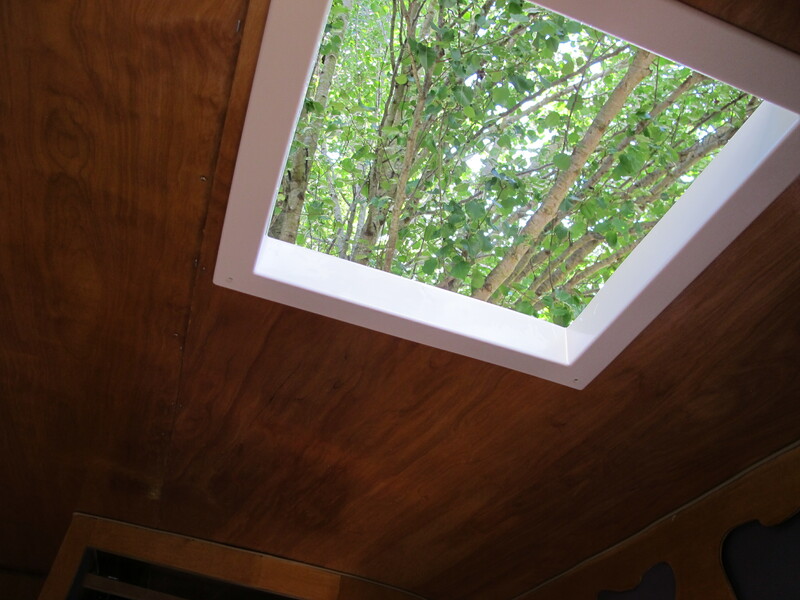 It’s nice to have a little sky light! I was so exhausted after getting the things above done that I called it a day. 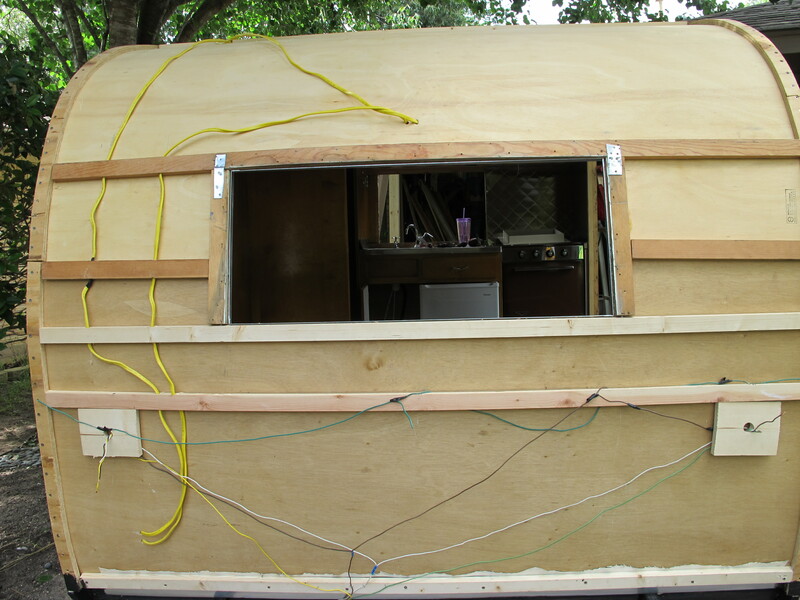 Tomorrow, I will run the new wires for the lights/outlets, finish connecting the tail light wiring for the side running lights, and install the insulation. 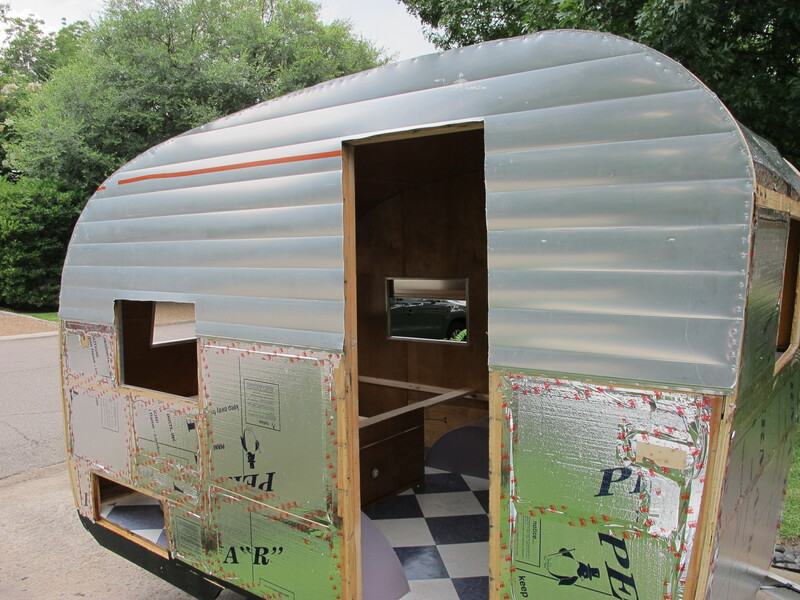 I also have to add a few more pieces to the frame around the vent and one more piece to the front of the camper frame. Hopefully it all goes well and I will be ready to install the skin on Saturday! I’m a little nervous about the skin because based on my past experience, everything is always harder than I thought it would be so this will probably be no different. Oh well, I will give it my all and hope for the best! That’s all anyone can do in life anyway. Stayed tuned to see if I got everything on my list accomplished tomorrow! Posted in 1961 Shasta Restoration Project and tagged 1961, canned ham trailers, exterior vintage camper photos, glampers, glamping, Hemet Valley RV, Houston, interior vintage camper photos, Junebug, projects, renovation, renovation projects, restoration, Shasta camper, Shasta Compact, Sisters on the fly, Tin Can Tourist, tiny houses, travel trailers, Vintage Camper Rally, vintage camper restoration, vintage campers, vintage Shasta. Bookmark the permalink. Today was the one day this week that I had to go to my actual job that pays my bills, so I couldn’t work on Junebug. Luckily that’s over now and I can get back to the fun stuff. I decided to make a list of everything I need to do before I put the new skin on Junebug. I have other projects that I would probably rather work on, but I need to prioritize. The skin is supposed to arrive tomorrow between 3 and 6pm, according to the freight shipping company. When I posted my complaints about dealing with the shipping company on http://vintagetrailertalk.freeforums.net/ it was funny how many others had similar experiences. 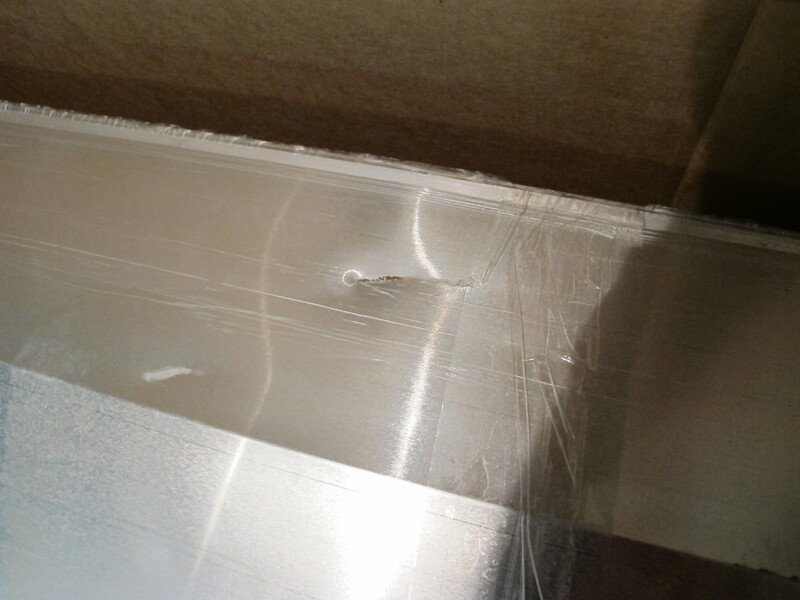 Apparently, freight shipping companies really hate customers like me who order heavy items to be delivered to my residential address. I called my friend Jennifer to come over tomorrow during that window to help me unload the boxes. They will each be 11 feet long, not sure how wide, and weigh about 100 pounds each. My AC unit that I got for Junebug weighs 50 lbs and I can lift it no problem, so I am pretty sure we can lift those boxes. Fingers crossed! 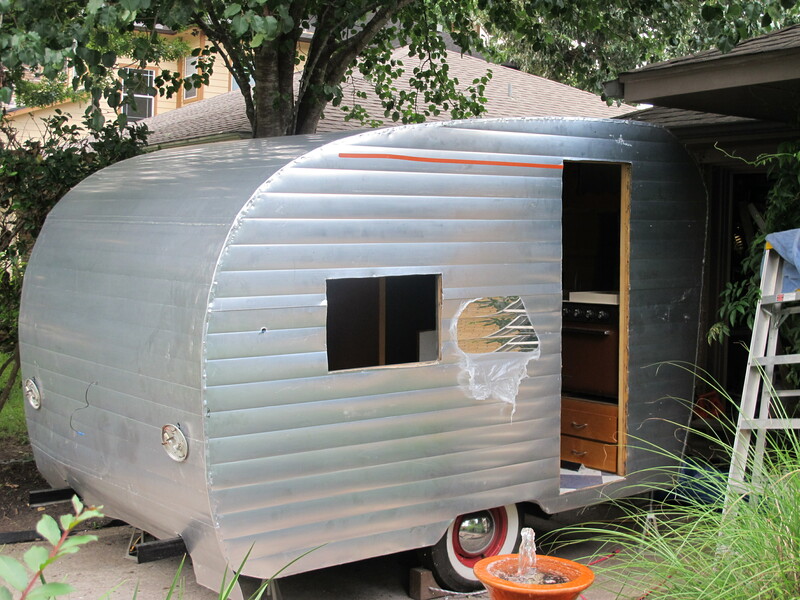 To give you an idea of the exterior look that I’ll be going for on Junebug, here’s a picture of another camper with a similar design. 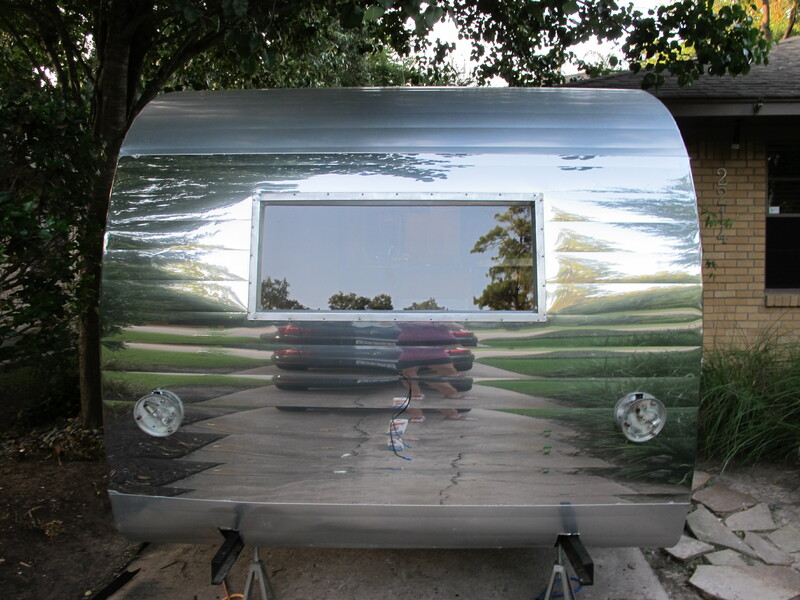 I would like to keep the top half silver as well and paint the bottom half a lavender color. I still haven’t decided on the stripe, I thought about doing the white stripe like the pic below, but I also thought a light green stripe would be fun. It would definitely give it a different look with the green stripe. Here’s the list of things I need to accomplish before Saturday, when I have three friends coming over to help me put the skin on. 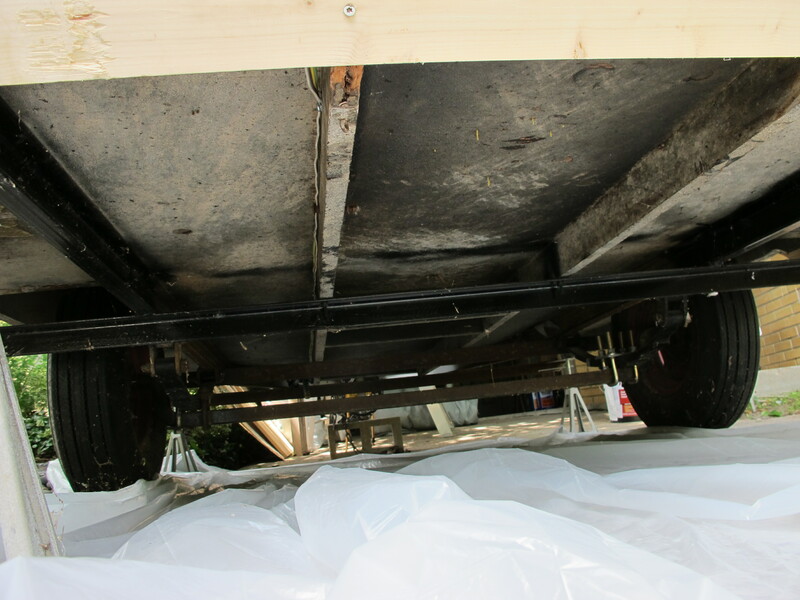 Install one more piece of wood along the bottom rear of Junebug for skin to attach to, will need to modify slightly from original design due to the steel beams sticking out of the back for the bumper. Finish running the wiring for the running lights and license plate light and hook up to car to test. Paint undercarriage with black fence post paint after spraying some sealant on the seam of the metal flashing along the rear undercarriage (just to be extra sure it’ll stay dry). 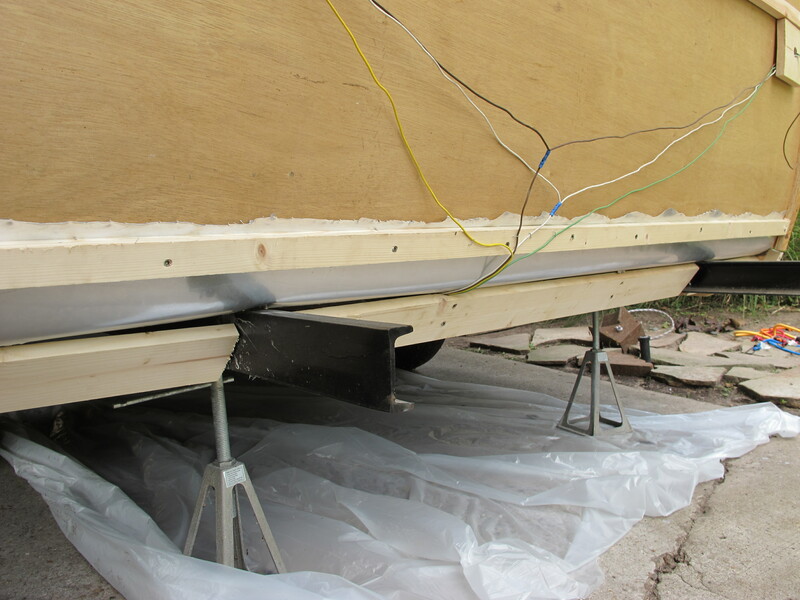 Finish building a new frame and support beam for the roof vent and install. 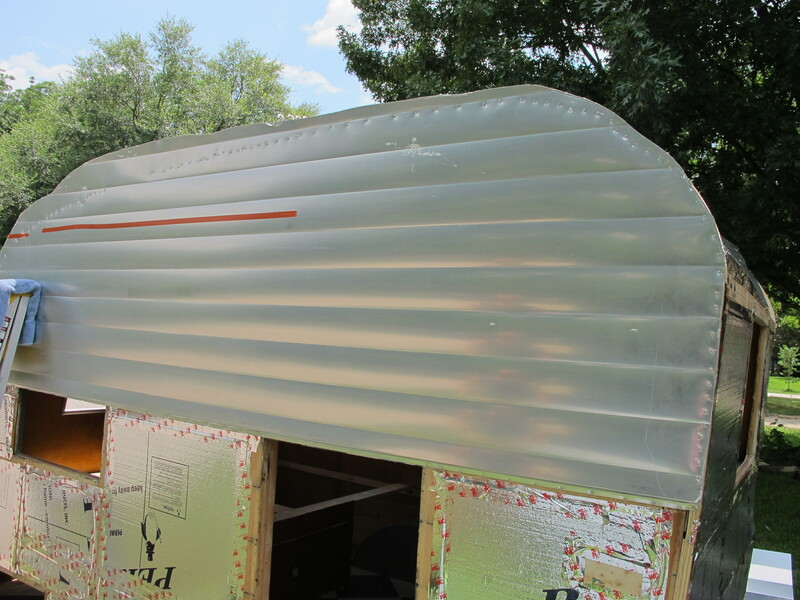 Purchase rigid foam insulation and install (I’ll do this last on this list). 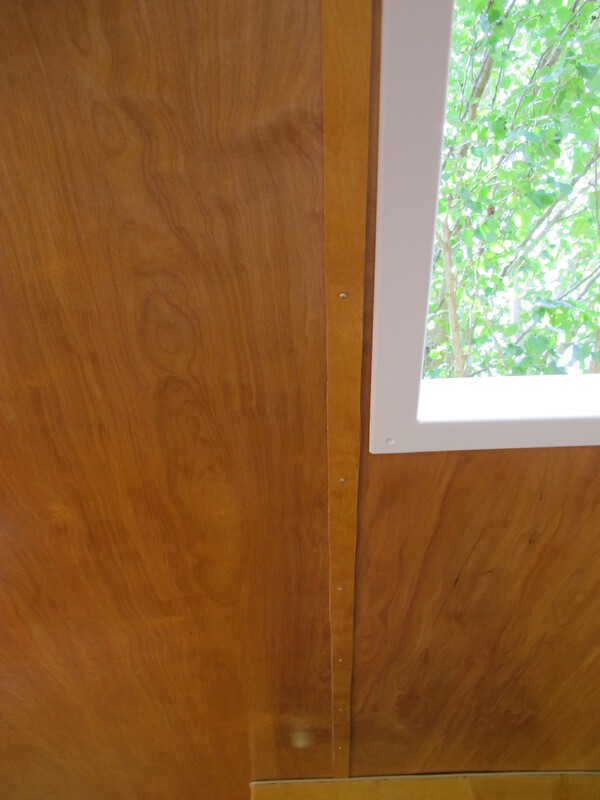 Add finishing trim along seams in the paneling as well as trim around kitchen countertop and backsplash. Finish building new frame for bed and benches, apply shellac, and install. Install air vents in the appropriate locations for the new AC. 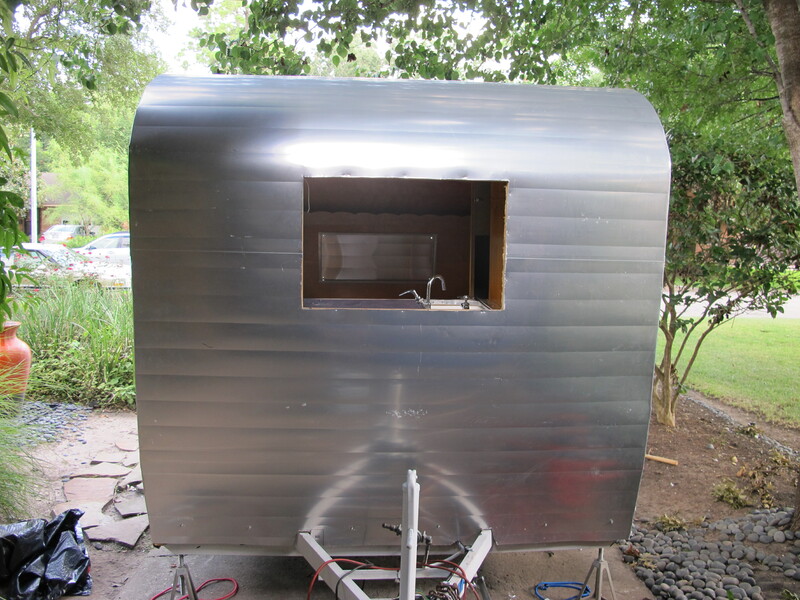 Finish cleaning all windows and polish the aluminum. Strip old paint off of door hardware, window eyebrows, and j-rail. 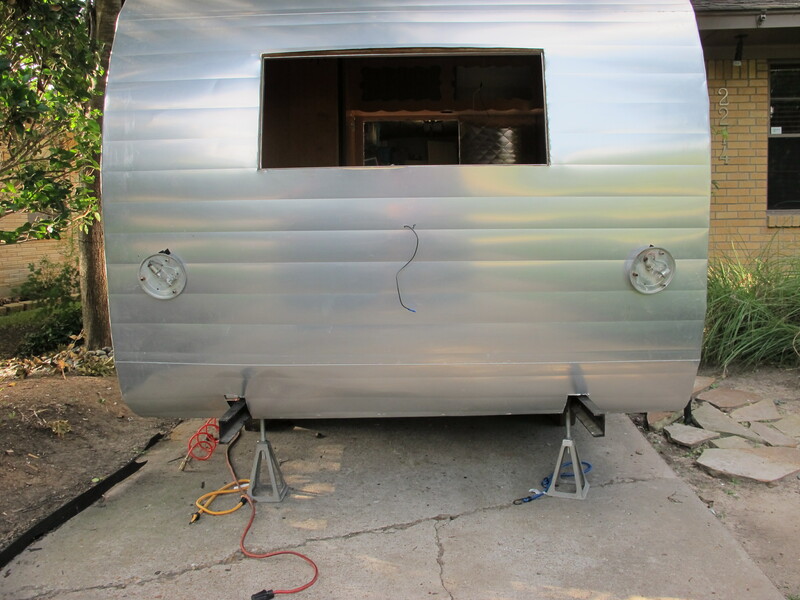 Re-install windows with new putty tape and stainless steel screws as well as j-rail and eyebrows. 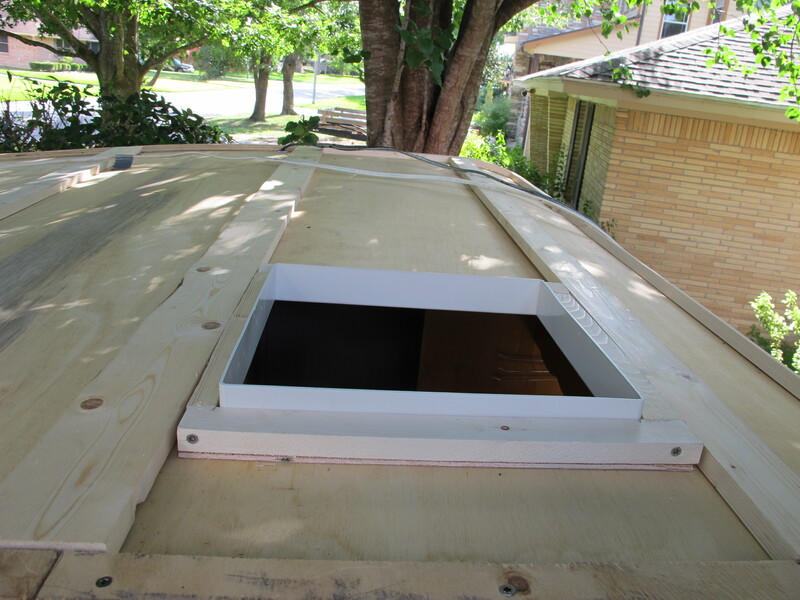 Install Fantastic Vent in roof and seal. 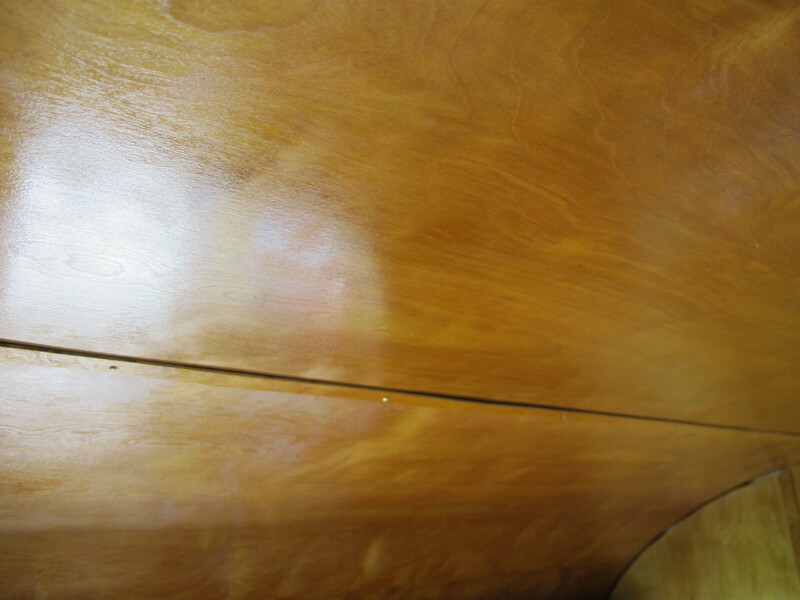 Apply shellac to the interior of the new door and add new skin to exterior of door, then install. Repeat same process for the baggage door. Add finishing touches on interior like hanging curtains, pictures, add bedding, etc. Hopefully finish by end of July so I can take Junebug to my grandma’s house to show my family. Have unveiling party for Junebug and invite all of my friends and family who wonder where I’ve been all this time and are starting to worry about my obsession. 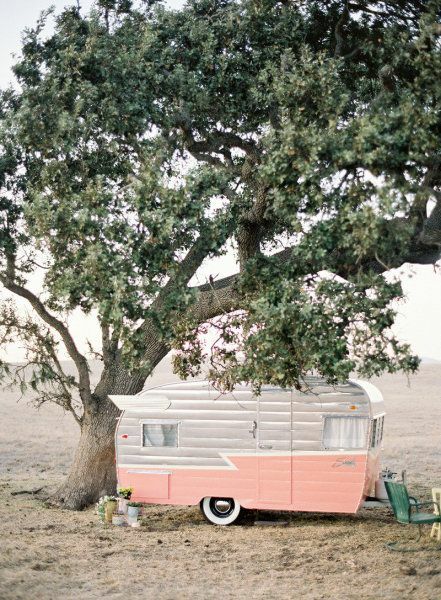 Go to first vintage camper rally in September! So, I still have a lot left to do, but I think I can do multiple things on the list in one day, so hopefully I can make good progress over the next few weeks. I had better get to work studying electrical circuits tonight since I am now going to be doing that project myself too. Thank goodness for the internet! 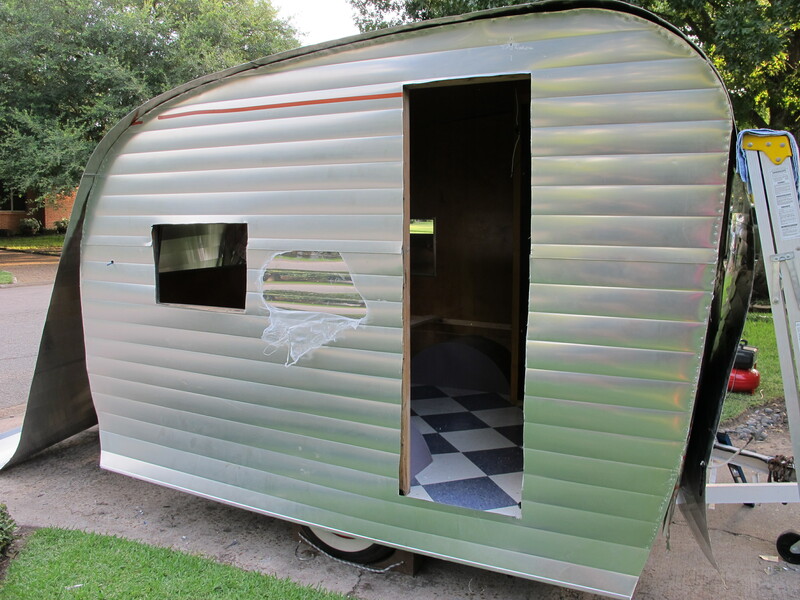 Posted in 1961 Shasta Restoration Project and tagged 1961, canned ham trailers, DIY, exterior vintage camper photos, glampers, glamping, Hobby, Houston, interior vintage camper photos, Junebug, projects, renovation, renovation projects, restoration, Shasta camper, Shasta Compact, shellac, Sisters on the fly, Tin Can Tourist, tiny houses, travel trailers, Vintage Camper Rally, vintage camper restoration, vintage campers, vintage Shasta. Bookmark the permalink.